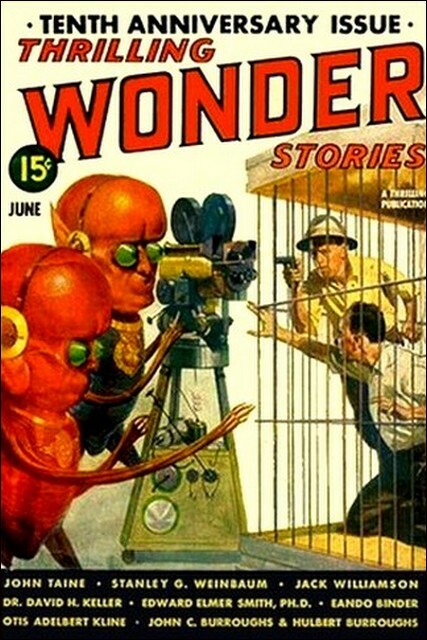 Thrilling Wonder Stories, June 1939. Cover by Howard Brown. All conversation ascribed to the Princess Margaret in this story is taken verbatim from an anonymous volume published in Urbs in the year 186, called Loves of the Black Flame. It is credited to Jacques Lebeau, officer in command of the Black Flame's personal guard. He passed the place where the great steel road of the Ancients had been, now only two rusty streaks and a row of decayed logs. Beside it was the mossy heap of stones that had been an ancient structure in the days before the Dark Centuries, when Ozarky had been a part of the old state of M'souri. The mountain people still sought out the place for squared stones to use in building, but the tough metal of the steel road itself was too stubborn for their use, and the rails had rusted quietly these three hundred years. Hull had only a bow. He didn't see the use of guns; powder and ball cost money, but an arrow did the same work for nothing, and that without scaring all the game a mile away. Morning he bade goodbye to the Hobels, who thought him, as they always had, a little crazy, and set off. His powerful, brown bare legs flashed under his ragged trousers, his bare feet made a pleasant swoosh in the dust of the road, the June sun beat warm on his right cheek. He was happy; there never was a pleasanter world than this, so he grinned and whistled, and spat carefully into the dust, remembering that it was bad luck to spit toward the sun. He was bound for adventure. Adventure came. Hull had come down to the plain now, where the trees were taller than the scrub of the hill country, and where the occasional farms were broader, well tilled, more prosperous. The trail had become a wagon road, and here it cut and angled between two lines of forest. And unexpectedly a man—no, two men—rose from a log at the roadside and approached Hull. He watched them; one was tall and light-haired as himself, but without his mighty frame, and the other was a head shorter, and dark. Valley people, surely, for the dark one had a stubby pistol at his belt, wooden-stocked like those of the Ancients, and the tall man's bow was of glittering spring steel. "Ho, mountainy!" said the dark one. "Where going?" "My tongue," snapped the youth. "Easy, there," grunted the light man. "No offense, mountainy. We're just curious. That's a good knife you got. I'll trade it." "For lead in your craw," growled the dark one. Suddenly the blunt pistol was in his hand. "Pass it over, and the bag too." Hull scowled from one to the other. At last he shrugged, and moved as if to lift his bag from his shoulders. And then, swift as the thrust of a striking diamondback, his left foot shot forward, catching the dark one squarely in the pit of his stomach, with the might of Hull's muscles and weight behind it. The man had breath for a low grunt; he doubled and fell, while his weapon spun a dozen feet away into the dust. The light one sprang for it, but Hull caught him with a great arm about his throat, wrenched twice, and the brief fight was over. He swung placidly on toward Norse with a blunt revolver primed and capped at his hip, a glistening spring-steel bow on his shoulder, and twenty-two bright tubular steel arrows in his quiver. He topped a little rise and the town lay before him. He stared. A hundred houses at least. Must be five hundred people in the town, more people than he'd ever seen in his life all together. He strode eagerly on, goggling at the church that towered high as a tall tree, at the windows of bits of glass salvaged from ancient ruins and carefully pieced together, at the tavern with its swinging emblem of an unbelievably fat man holding a mammoth mug. He stared at the houses, some of them with shops before them, and at the people, most of them shod in leather. He himself attracted little attention. Norse was used to the mountainies, and only a girl or two turned appraising eyes toward his mighty figure. That made him uncomfortable, however; the girls of the mountains giggled and blushed, but never at that age did they stare at a man. So he gazed defiantly back, letting his eyes wander from their bonnets to the billowing skirts above their leather strap-sandals, and they laughed and passed on. Hull didn't care for Norse, he decided. As the sun set, the houses loomed too close, as if they'd stifle him, so he set out into the countryside to sleep. The remains of an ancient town bordered the village, with its spectral walls crumbling against the west. There were ghosts there, of course, so he walked farther, found a wooded spot, and lay down, putting his bow and the steel arrows into his bag against the rusting effect of night-dew. Then he tied the bag about his bare feet and legs, sprawled comfortably, and slept with his hand on the pistol grip. Of course there were no animals to fear in these woods save wolves, and they never attacked humans during the warm parts of the year, but there were men, and they bound themselves by no such seasonal laws. He awoke dewy wet. The sun shot golden lances through the trees, and he was ravenously hungry. He ate the last of his mother's brown bread from his bag, now crumbled by his feet, and then strode out to the road. There was a wagon creaking there, plodding northward; the bearded, kindly man in it was glad enough to have him ride for company. "Well," observed the other, "it's a big place, and all I've seen of it much like this. All except Selui. That's a city. Yes, that's a city. Been there?" "It's got," said the farmer impressively, "twenty thousand people in it. Maybe more. And they got ruins there the biggest you ever saw. Bridges. Buildings. Four—five times as high as the Norse church, and at that they're fallen down. The Devil knows how high they used to be in the old days." "Who lived in 'em?" asked Hull. "Don't know. Who'd want to live so high up it'd take a full morning to climb there? Unless it was magic. I don't hold much with magic, but they do say the Old People knew how to fly." Hull tried to imagine this. For a while there was silence save for the slow clump of the horses' hooves. "I don't believe it," he said at last. "Nor I. But did you hear what they're saying in Norse?" "They say," said the farmer, "that Joaquin Smith is going to march again." "Yeah. Even the mountainies know about him, eh?" "Who doesn't?" returned Hull. "Then there'll be fighting in the south, I guess. I have a notion to go south." "I like fighting," said Hull simply. "Fair answer," said the farmer, "but from what folks say, there's not much fighting when the Master marches. He has a spell; there's great sorcery in N'Orleans, from the merest warlock up to Martin Sair, who's blood-son of the Devil himself, or so they say." "I'd like to see his sorcery against the mountainy's arrow and ball," said Hull grimly. "There's none of us can't spot either eye at a thousand paces, using rifle. Or two hundred with arrow." "No doubt; but what if powder flames, and guns fire themselves before he's even across the horizon? They say he has a spell for that, he or Black Margot." "The Princess, his half-sister. The dark witch who rides beside him, the Princess Margaret." The farmer shrugged. "Who knows? It's what her enemies call her." "Then so I call her," said Hull. "Well, I don't know," said the other. "It makes small difference to me whether I pay taxes to N'Orleans or to gruff old Marcus Ormiston, who's eldarch of Ormiston village there." He flicked his whip toward the distance ahead, where Hull now descried houses and the flash of a little river. "I've sold produce in towns within the Empire, and the people of them seemed as happy as ourselves, no more, no less." "There is a difference, though. It's freedom." "Merely a word, my friend. They plow, they sow, they reap, just as we do. They hunt, they fish, they fight. And as for freedom, are they less free with a warlock to rule them than I with a wizened fool?" "The mountainies pay taxes to no one." "And no one builds them roads, nor digs them public wells. Where you pay little you get less, and I will say that the roads within the Empire are better than ours." "Better than this?" asked Hull, staring at the dusty width of the highway. "Far better. Near Memphis town is a road of solid rock, which they spread soft through some magic, and let harden, so there is neither mud nor dust." Hull mused over this. "The Master," he burst out suddenly, "is he really immortal?" The other shrugged. "How can I say? There are great sorcerers in the southlands, and the greatest of them is Martin Sair. But I do know this, that I have seen sixty-two years, and as far back as memory goes here was always Joaquin Smith in the south, and always an Empire gobbling cities as a hare gobbles carrots. When I was young it was far away, now it reaches close at hand; that is all the difference. Men talked of the beauty of Black Margot then as they do now, and of the wizardry of Martin Sair. Hull made no answer, for Ormiston was at hand. The village was much like Norse save that it huddled among low hills, on the crest of some of which loomed ancient ruins. At the near side his companion halted, and Hull thanked him as he leaped to the ground. "Where to?" asked the farmer. Hull thought a moment. "Selui," he said. "Well, it's a hundred miles, but there'll be many to ride you." "I have my own feet," said the youth. He spun suddenly about at a voice across the road: "Hi! Mountainy!" It was a girl. A very pretty girl, slim waisted, copper haired, blue eyed, standing at the gate before a large stone house. "Hi!" she called. "Will you work for your dinner?" Hull was ravenous again. "Gladly!" he cried. The voice of the farmer sounded behind him. "It's Vail Ormiston, the dotard eldarch's daughter. Hold her for a full meal, mountainy. My taxes are paying for it." But Vail Ormiston was above much converse with a wandering mountain-man. She surveyed his mighty form approvingly, showed him the logs he was to quarter, and then disappeared into the house. If, perchance, she peeped out through the clearest of the ancient glass fragments that formed the window, and if she watched the flexing muscles of his great bare arms as he swung the axe—well, he was unaware of it. So it happened that afternoon found him trudging toward Selui with a hearty meal inside him and three silver dimes in his pocket, ancient money, with the striding figure of the woman all but worn away. He was richer than when he had set out by those coins, by the blunt pistol at his hip, by the shiny steel bow and arrows, and by the memory of the copper hair and blue eyes of Vail Ormiston. Three weeks in Selui had served to give Hull Tarvish a sort of speaking acquaintance with the place. He no longer gaped at the sky-piercing ruins of the ancient city, or the vast fallen bridges, and he was quite at home in the town that lay beside it. He had found work easily enough in a baker's establishment, where his great muscles served well; the hours were long, but his pay was munificent—five silver quarters a week. He paid two for lodging, and food—what he needed beyond the burnt loaves at hand from his employment cost him another quarter, but that left two to put by. He never gambled other than a wager now and then on his own marksmanship, and that was more profitable than otherwise. Ordinarily Hull was quick to make friends, but his long hours hindered him. He had but one, an incredibly old man who sat at evening on the step beyond his lodging, Old Einar. So this evening Hull wandered out as usual to join him, staring at the crumbling towers of the Ancients glowing in the sunset. Trees sprung on many, and all were green with vine and tussock and the growth of wind-carried seeds. No one dared build among the ruins, for none could guess when a great tower might come crashing down. "I wonder," he said to Old Einar, "what the Ancients were like. Were they men like us? Then how could they fly?" "They were men like us, Hull. As for flying—well, it's my belief that flying is a legend. See here; there was a man supposed to have flown over the cold lands to the north and those to the south, and also across the great sea. But this flying man is called in some accounts Lindbird and in others Bird and surely one can see the origin of such a legend. The migrations of birds, who cross land and seas each year, that is all." "Or perhaps magic," suggested Hull. "There is no magic. The Ancients themselves denied it and I have struggled through many a moldy book in a curious, archaic tongue." Old Einar was the first scholar Hull had ever encountered. Though there were many during the dawn of that brilliant age called the Second Enlightenment, most of them were still within the Empire. John Holland was dead, but Olin was yet alive in the world, and Kohlmar, and Jorgensen, and Teran, and Martin Sair, and Joaquin Smith the Master. Great names—the names of demigods. But Hull knew little of them. "You can read!" he exclaimed. "That in itself is a sort of magic. And you have been within the Empire, even in N'Orleans. Tell me, what is the Great City like? Have they really learned the secrets of the Ancients? Are the Immortals truly immortal? How did they gain their knowledge?" Old Einar settled himself on the step and puffed blue smoke from his pipe filled with the harsh tobacco of the region. "Too many questions breed answers to none," he observed. "Shall I tell you the true story of the world, Hull—the story called History?" "Yes. In Ozarky we spoke little of such things." "Well," said the old man comfortably, "I will begin then, at what to us is the beginning, but to the Ancients was the end. I do not know what factors, what wars, what struggles, led up to the mighty world that died during the Dark Centuries, but I do know that three hundred years ago the world reached its climax. You cannot imagine such a place, Hull. It was a time of vast cities, too—fifty times as large as N'Orleans with its hundred thousand people." He puffed slowly. "Great steel wagons roared over the iron roads of the Ancients. Men crossed the oceans to east and west. The cities were full of whirring wheels, and instead of the many little city-states of our time, there were giant nations with thousands of cities and a hundred million —a hundred and fifty million people." Hull stared. "I do not believe there are so many people in the world," he said. Old Einar shrugged. "Who knows?" he returned. "The ancient books— all too few—tell us that the world is round, and that beyond the seas lie one, or several continents, but what races are there today not even Joaquin Smith can say." He puffed smoke again. "Well, such was the ancient world. These were warlike nations, so fond of battle that they had to write many books about the horrors of war to keep themselves at peace, but they always failed. During the time they called their twentieth century there was a whole series of wars, not such little quarrels as we have so often between our city-states, nor even such as that between the Memphis League and the Empire, five years ago. Their wars spread like storm clouds around the world, and were fought between millions of men with unimaginable weapons that flung destruction a hundred miles, and with ships on the seas, and with gases." Old Einar waved his hand so that the wind of it brushed the youth's brown cheek. "Air is a gas," he said. "They knew how to poison the air so that all who breathed it died. And they fought with diseases, and legend says that they fought also in the air with wings, but that is only legend." "Diseases!" said Hull. "Diseases are the breath of Devils, and if they controlled Devils they used sorcery, and therefore they knew magic." "There is no magic," reiterated the old man. "I do not know how they fought each other with diseases, but Martin Sair of N'Orleans knows. That was his study, not mine, but I know there was no magic in it." He resumed his tale. "So these great fierce nations flung themselves against each other, for war meant more to them than to us. With us it is something of a rough, joyous, dangerous game, but to them it was a passion. They fought for any reason, or for none at all save the love of fighting." "I love fighting," said Hull. "Yes, but would you love it if it meant simply the destroying of thousands of men beyond the horizon? Men you were never to see?" "No. War should be man to man, or at least no farther than the carry of a rifle ball." "True. Well, some time near the end of their twentieth century, the ancient world exploded into war like a powder horn in a fire. They say every nation fought, and battles surged back and forth across seas and continents. It was not only nation against nation, but race against race, black and white and yellow and red, all embroiled in a titanic struggle." "Yellow and red?" echoed Hull. "There are a few black men called Nigs in Ozarky, but I never heard of yellow or red men." "I have seen yellow men," said Old Einar. "There are some towns of yellow men on the edge of the western ocean, in the region called Friscia. The red race, they say, is gone, wiped out by the plague called the Grey Death, to which they yielded more readily than the other races." "I have heard of the Grey Death," said Hull. "When I was very young, there was an old, old man who used to say that his grand-father had lived in the days of the Death." Old Einar smiled. "I doubt it, Hull. It was something over two and a half centuries ago. However," he resumed, "the great ancient nations were at war, and as I say, they fought with diseases. Whether some nation learned the secret of the Grey Death, or whether it grew up as a sort of cross between two or more other diseases, I do not know. Martin Sair says that diseases are living things, so it may be so. At any rate, the Grey Death leaped suddenly across the world, striking alike at all people. Everywhere it blasted the armies, the cities, the countryside, and of those it struck, six out of every ten died. There must have been chaos in the world; we have not a single book printed during that time, and only legend tells the story. "But the war collapsed. Armies suddenly found themselves unopposed, and then were blasted before they could move. Ships in mid-ocean were stricken, and drifted unmanned to pile in wreckage, or to destroy others. In the cities the dead were piled in the streets, and after a while, were simply left where they fell, while those who survived fled away into the country. What remained of the armies became little better than roving robber bands, and by the third year of the plague there were few if any stable governments in the world." "What stopped it?" asked Hull. "I do not know. They end, these pestilences. Those who take it and live cannot take it a second time, and those who are somehow immune do not take it at all, and the rest—die. The Grey Death swept the world for three years; when it ended, according to Martin Sair, one person in four had died. But the plague came back in lessening waves for many years; only a pestilence in the Ancient's fourteenth century, called the Black Death, seems ever to have equaled it. "Yet its effects were only beginning. The ancient transport system had simply collapsed, and the cities were starving. Hungry gangs began raiding the countryside, and instead of one vast war there were now a million little battles. The weapons of the Ancients were everywhere, and these battles were fierce enough, in all truth, though nothing like the colossal encounters of the great war. Year by year the cities decayed until by the fiftieth year after the Grey Death, the world's population had fallen by three-fourths, and civilization was ended. It was barbarism now that ruled the world, but only barbarism, not savagery. People still remembered the mighty ancient civilization, and everywhere there were attempts to combine into the old nations, but these failed for lack of great leaders." "As they should fail," said Hull. "We have freedom now." "Perhaps. By the first century after the Plague, there was little left of the Ancients save their ruined cities where lurked robber bands that scoured the country by night. They had little interest in anything save food or the coined money of the old nations, and they did incalculable damage. Few could read, and on cold nights was usual to raid the ancient libraries for books to burn and to make things worse, fire gutted the ruins of all cities, and there was no organized resistance to it. The flames simply burned themselves out, and priceless books vanished." "Yet in N'Orleans they study, don't they?" asked Hull. "Yes, I'm coming to that. About two centuries after the Plague—a hundred years ago, that is—the world had stabilized itself. It was much as it is here today, with little farming towns and vast stretches of deserted country. Gunpowder had been rediscovered, rifles were used, and most of the robber bands had been destroyed. And then, into the town of N'Orleans, built beside the ancient city, came young John Holland. "Holland was a rare specimen, anxious for learning. He found the remains of an ancient library and began slowly to decipher the archaic words in the few books that had survived. Little by little others joined him, and as the word spread slowly, men from other sections wandered in with books, and the Academy was born. No one taught, of course; it was just a group of studious men living a sort of communistic, monastic life. 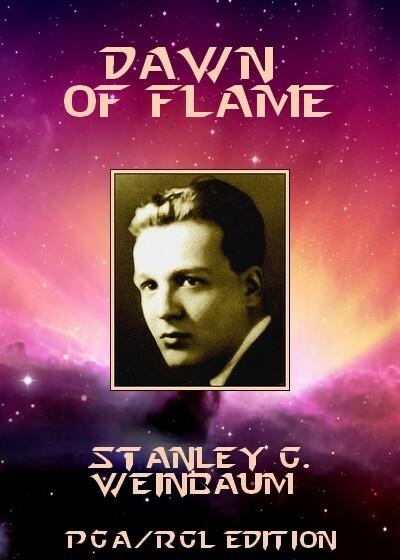 There was no attempt at practical use of the ancient knowledge until a youth named Teran had a dream —no less a dream than to recondition the centuries-old power machines of N'Orleans, to give the city the power that travels on wires!" "What's that?" asked Hull. "What's that, Old Einar?" "You wouldn't understand, Hull. Teran was an enthusiast; it didn't stop him to realize that there was no coal or oil to run his machines. He believed that when power was needed, it would be there, so he and his followers scrubbed and filed and welded away, and Teran was right. When he needed power, it was there. "This was the gift of a man named Olin, who had unearthed the last, the crowning secret of the Ancients, the power called atomic energy. He gave it to Teran, and N'Orleans became a miracle city where lights glowed and wheels turned. Men came from every part of the continent to see, and among these were two called Martin Sair and Joaquin Smith, come out of Mexico with the half-sister of Joaquin, the satanically beautiful being sometimes called Black Margot. "Martin Sair was a genius. He found his field in the study of medicine, and it was less than ten years before he had uncovered the secret of the hard rays. He was studying sterility but he found—immortality!" "Then the Immortals are immortal !" murmured Hull. "It may be, Hull. At least they do not seem to age, but—Well, Joaquin Smith was also a genius, but of a different sort. He dreamed of the re-uniting of the peoples of the country. I think he dreams of even more, Hull; people say he will stop when he rules a hundred cities, but I think he dreams of an American Empire, or"—Old Einar's voice dropped—"a world Empire. At least, he took Martin Sair's immortality and traded it for power. The Second Enlightenment was dawning and there was genius in N'Orleans. He traded immortality to Kohlmar for a weapon, he offered it to Olin for atomic power, but Olin was already past youth, and refused, partly because he didn't want it, and partly because he was not entirely in sympathy with Joaquin Smith. So the Master seized the secret of the atom despite Olin, and the Conquest began. "N'Orleans, directly under the influence of the Master's magnetic personality, was ready to yield, and yielded to him cheering. He raised his army and marched north, and everywhere cities fell or yielded willingly. Joaquin Smith is magnificent, and men flock to him, cities cheer him, even the wives and children of the slain swear allegiance when he forgives them in that noble manner of his. Only here and there men hate him bitterly, and speak such words as tyrant, and talk of freedom." "Such are the mountainies," said Hull. "Not even the mountainies can stand the ionic beams that Kohlmar dug out of ancient books, nor the Erden resonator that explodes gunpowder miles away. I think that Joaquin Smith will succeed, Hull. Moreover, I do not think it entirely bad that he should, for he is a great ruler, and a bringer of civilization." "What are they like, the Immortals?" "Well, Martin Sair is as cold as mountain rock, and the Princess Margaret is like black fire. Even my old bones feel younger only to look at her, and it is wise for young men not to look at her at all, because she is quite heartless, ruthless, and pitiless. As for Joaquin Smith, the Master—I do not know the words to describe so complex a character, and I know him well. He is mild, perhaps, but enormously strong, kind or cruel as suits his purpose, glitteringly intelligent, and dangerously charming." "You know him!" echoed Hull, and added curiously, "What is your other name, Old Einar, you who know the Immortals?" The old man smiled. "When I was born," he said, "my parents called me Einar Olin." Hull Tarvish leaned against the door of File Ormson's iron worker's shop in Ormiston, and stared across the fields and across the woodlands, and across to the blue mountains of Ozarky in the south. There is where he should have been, there with the mountainy men, but by the time the tired rider had brought the news to Selui, and by the time Hull had reached Ormiston, it was already too late, and Ozarky was but an outlying province of the expanding Empire, while the Master camped there above Norse, and sent representations to Selui. Selui wasn't going to yield. Already the towns of the three months old Selui Confederation were sending in their men, from Bloom'ton, from Cairo, even from distant Ch'cago on the shores of the saltless sea Mitchin. The men of the Confederation hated the little, slender, dark Ch'cagoans, for they had not yet forgotten the disastrous battle at Starved Rock, but any allies were welcome against Joaquin Smith. The Ch'cagoans were good enough fighters, too, and heart and soul in the cause, for if the Master took Selui, his Empire would reach dangerously close to the saltless seas, spreading from the ocean on the cast to the mountains on the west, and north as far as the great confluence of the M'sippi and M'souri. Hull knew there was fighting ahead, and he relished it. It was too bad that he couldn't have fought in Ozarky for his own people, but Ormiston would do. That was his home for the present, since he'd found work here with File Ormson, the squat iron-worker, broad-shouldered as Hull himself and a head shorter. Pleasant work for his mighty muscles, though at the moment there was nothing to do. And rain to make the harvest grow. And last the digger with his black spade. And a fireplace warm when the work is done. "This is what his son needs—"
Hull ceased to listen. They were singing, but Joaquin Smith was marching, marching with the men of a hundred cities, with his black banner and its golden serpent fluttering. That serpent, Old Einar had said, was the Midgard Serpent, which ancient legend related had encircled the earth. It was the symbol of the Master's dream, and for a moment Hull had a stirring of sympathy for that dream. "No!" he growled to himself. "Freedom's better, and it's for us to blow the head from the Midgard Serpent." A voice sounded at his side. "Hull! Big Hull Tarvish! Are you too proud to notice humble folk?" It was Vail Ormiston, her violet eyes whimsical below her smooth copper hair. He flushed; he was not used to the ways of these valley girls, who flirted frankly and openly in a manner impossible to the shy girls of the mountains. Yet he—well, in a way, he liked it, and he liked Vail Ormiston, and he remembered pleasantly an evening two days ago when he had sat and talked a full three hours with her on the bench by the tree that shaded Ormiston well. And he remembered the walk through the fields when she had shown him the mouth of the great ancient storm sewer that had run under the dead city, and that still stretched crumbling for miles underground toward the hills, and he recalled her story of how, when a child, she had lost herself in it, so that her father had planted the tangle of blackberry bushes that still concealed the opening. He grinned, "Is it the eldarch's daughter speaking of humble folk? Your father will be taxing me double if he hears of this." She tossed her helmet of metallic hair. "He will if he sees you in that Selui finery of yours." Her eyes twinkled. "For whose eyes was it bought, Hull? For you'd be better saving your money." "Save silver, lose luck," he retorted. After all, it wasn't so difficult a task to talk to her. "Anyway, better a smile from you than the glitter of money." She laughed. "But how quickly you learn, mountainy! Still, what if I say I liked you better in tatters, with your powerful brown muscles quivering through the rips?" "Do you say it, Vail?" He chuckled, raising his great hands to his shoulders. There was the rasp of tearing cloth, and a long rent gleamed in the back of his Selui shirt. "There, Vail!" "Oh!" she gasped. "Hull, you wastrel! But it's only a seam." She fumbled in the bag at her belt. "Let me stitch it back for you." She bent behind him, and he could feel her breath on his skin, warm as spring sunshine. He set his jaw, scowled, and then plunged determinedly into what he had to say. "I'd like to talk to you again this evening, Vail." He sensed her smile at his back. "Would you?" she murmured demurely. "Yes, if Enoch Ormiston hasn't spoken first for your time." He knew she was teasing him deliberately. "I'm sorry," he said shortly. "But—I told him I was busy," she finished. Her voice was a whisper behind him. "No. Not unless you tell me I am." His great roar of a laugh sounded. "Then I tell you so, Vail." He felt her tug at the seam, then she leaned very close to his neck, but it was only to bite the thread with her white teeth. "So!" she said gaily. "Once mended, twice new." Before Hull could answer there came the clang of File Ormson's sledge, and the measured bellow of his Forge Song. They listened as his resounding strokes beat time to the song. Like the revels of the devils down below—low—LOW! Like the revels of the devils down below!" "I must go," said Hull, smiling reluctantly. "There's work for me now." "What does File make?" asked Vail. Instantly Hull's smile faded. "He forges—a sword!" Vail too was no longer the joyous one of a moment ago. Over both of them had come a shadow, the shadow of the Empire. Out in the blue hills of Ozarky Joaquin Smith was marching. Evening. Hull watched the glint of a copper moon on Vail's copper hair, and leaned back on the bench. Not the one near the pump this time; that had been already occupied by two laughing couples, and though they had been welcomed eagerly enough, Hull had preferred to be alone. It wasn't mountain shyness any more, for his great, good-natured presence had found ready friendship in Ormiston village; it was merely the projection of that moodiness that had settled over both of them at parting, and so they sat now on the bench near Vail Ormiston's gate at the edge of town. Behind them the stone house loomed dark, for her father was scurrying about in town on Confederation business, and the help had availed themselves of the evening of freedom to join the crowd in the village square. But the yellow daylight of the oillamp showed across the road in the house of Hue Helm, the farmer who had brought Hull from Norse to Ormiston. It was at this light that Hull stared thoughtfully. "I like fighting," he repeated, "but somehow the joy has gone out of this. It's as if one waited an approaching thunder cloud." "How," asked Vail in a timid, small voice, "can one fight magic?" "There is no magic," said the youth, echoing Old Einar's words. "There is no such thing—"
"Hull! How can you say such stupid words?" "I say what was told me by one who knows." "No magic!" echoed Vail. "Then tell me what gives the wizards of the south their power. Why is it that Jaoquin Smith has never lost a battle? What stole away the courage of the men of the Memphis League, who are good fighting men? And what—for this I have seen with my own eyes—pushes the horseless wagons of N'Orleans through the streets, and what lights that city by night? If not magic, then what?" "Knowledge," said Hull. "The knowledge of the Ancients." "The knowledge of the Ancients was magic," said the girl. "Everyone knows that the Ancients were wizards, warlocks, and sorcerers. If Holland, Olin, and Martin Sair are not sorcerers, then what are they? If Black Margot is no witch, then my eyes never looked on one." "Have you seen them?" queried Hull. "Of course, all but Holland, who is dead. Three years ago during the Peace of Memphis my father and I traveled into the Empire. I saw all of them about the city of N'Orleans." "And is she—what they say she is?" "The Princess?" Vail's eyes dropped. "Men say she is beautiful." "What if she is?" snapped the girl almost defiantly. "Her beauty is like her youth, like her very life—artificial, preserved after its allotted time, frozen. That's it—frozen by sorcery. And as for the rest of her—" Vail's voice lowered, hesitated, for not even the plain-spoken valley girls discussed such things with men. "They say she has outworn a dozen lovers," she whispered. Hull was startled, shocked. "Vail!" he muttered. She swung the subject back to safer ground, but he saw her flush red. "Don't tell me there's no magic!" she said sharply. "At least," he returned, "there's no magic will stop a bullet save flesh and bone. Yes, and the wizard who stops one with his skull lies just as dead as an honest man." "I hope you're right," she breathed timidly. "Hull, he must be stopped! He must!" "But why feel so strongly, Vail? I like a fight—but men say that life in the Empire is much like life without, and who cares to whom he pays his taxes if only—" He broke off suddenly, remembering. "Your father!" he exclaimed. "The eldarch!" "Yes, my father, Hull. If Joaquin Smith takes Ormison, my father is the one to suffer. His taxes will be gone, his lands parceled out, and he's old, Hull—old. What will become of him then? I know many people feel the way you—the way you said, and so they fight half-heartedly, and the Master takes town after town without killing a single man. And then they think there is magic in the very name of Joaquin Smith, and he marches through armies that outnumber him ten to one." She paused. "But not Ormiston!" she cried fiercely. "Not if the women have to bear arms!" "Not Ormiston," he agreed gently. "You'll fight, Hull, won't you? Even though you're not Ormiston born?" "Of course. I have bow and sword, and a good pistol. I'll fight." "But no rifle? Wait, Hull." She rose and slipped away in the darkness. In a moment she was back again. "Here. Here is rifle and horn and ball. Do you know its use?" He smiled proudly. "What I can see I can hit," he said, "like any mountain man." "Then," she whispered with fire in her voice, "send me a bullet through the Master's skull. And one besides between the eyes of Black Margot— for me!" "I do not fight women," he said. "None the less, Vail, it must be two bullets for the Master and only the captive's chains for Princess Margaret, at least so far as Hull Tarvish is concerned. But wouldn't it please you fully as well to watch her draw water from your pump, or shine pots in your kitchen?" He was jollying her, trying to paint fanciful pictures to lift her spirit from the somber depths. But she read it otherwise. "Yes!" she blazed. "Oh, yes, Hull, that's better. If I could ever hope to see that—" She rose suddenly, and he followed her to the gate. "You must go," she murmured, "but before you leave, you can—if you wish it, Hull—kiss me." Of a sudden he was all shy mountainy again. He set the rifle against the fence with its horn swinging from the trigger guard. He faced her flushing a furious red, but only half from embarrassment, for the rest was happiness. He circled her with his great arms and very hastily, fire touched his lips to her soft ones. "Now," he said exultantly, "now I will fight if I have to charge the men of the Empire alone." The men of the Confederation were pouring into Ormiston all night long, the little dark men of Ch'cago and Selui, the tall blond ones from the regions of Iowa, where Dutch blood still survived, mingled now with a Scandinavian infusion from the upper rivers. All night there was a rumble of wagons, bringing powder and ball from Selui, and food as well for Ormiston couldn't even attempt to feed so many ravenous mouths. A magnificent army, ten thousand strong, and all of them seasoned fighting men, trained in a dozen little wars and in the bloody War of the Lakes and Rivers, when Ch'cago had bitten so large a piece from Selui territories. The stand was to be at Ormiston, and Norse, the only settlement now between Joaquin Smith and the Confederation, was left to its fate. Experienced leaders had examined the territory, and had agreed on a plan. Three miles south of the town, the road followed an ancient railroad cut, with fifty-foot embankments on either side, heavily wooded for a mile north and south of the bridge across Eaglefoot Flow. Along this course they were to distribute their men, a single line where the bluffs were high and steep, massed forces where the terrain permitted. Joaquin Smith must follow the road; there was no other. An ideal situation for ambush, and a magnificently simple plan. So magnificent and so simple that it could not fail, they said, and forgot completely that they were facing the supreme military genius of the entire Age of the Enlightenment. It was mid-morning when the woods—runners that had been sent into Ozarky returned with breath-taking news. Joaquin Smith had received the Selui defiance of his representations, and was marching. The Master was marching, and though they had come swiftly and had ridden horseback from Norse, he could not now be far distant. His forces? The runners estimated them at four thousand men, all mounted, with perhaps another thousand auxiliaries. Outnumbered two to one! But Hull Tarvish remembered tales of other encounters where Joaquin Smith had overcome greater odds than these. The time was at hand. In the little room beside File Ormson's workshop, Hull was going over his weapons while Vail Ormiston, pale and nervous and very lovely, watched him. He drew a bit of oiled rag through the bore of the rifle she had given him, rubbed a spot of rust from the hammer, blew a speck of dust from the pan. Beside him on the table lay powder horn and ball, and his steel bow leaned against his chair. "A sweet weapon!" he said admiringly, sighting down the long barrel. "I—I hope it serves you well," murmured Vail tremulously. "Hull, he must be stopped. He must!" "We'll try, Vail." He rose. "It's time I started." She was facing him. "Then, before you go, will you—kiss me, Hull?" He strode toward her, then recoiled in sudden alarm, for it was at that instant that the thing happened. There was a series of the faintest possible clicks, and Hull fancied that he saw for an instant a glistening of tiny blue sparks on candle-sticks and metal objects about the room, and that he felt for a brief moment a curious tingling. Then he forgot all of these strange trifles as the powder horn on the table roared into terrific flame, and flaming wads of powder shot meteor-like around him. For an instant he froze rigid. Vail was screaming; her dress was burning. He moved into sudden action, sweeping her from her feet, crashing her sideways to the floor, where his great hands beat out the fire. Then he slapped table and floor; he brought his ample sandals down on flaming spots, and finally there were no more flames. He turned coughing and choking in the black smoke, and bent over Vail, who gasped half overcome. Her skirt had burned to her knees, and for the moment she was too distraught to cover them, though there was no modesty in the world in those days like that of the women of the middle river regions. But as Hull leaned above her she huddled back. "Are you hurt?" he cried. "Vail, are you burned?" "Then outside!" he snapped, reaching down to lift her. He understood. He snatched his leather smith's apron from the wall, whipped it around her, and bore her into the clearer air of the street. Outside there was chaos. He set Vail gently on the step and surveyed a scene of turmoil. Men ran shouting, and from windows along the street black smoke poured. A dozen yards away a powder wagon had blasted itself into a vast mushroom of smoke, incinerating horses and driver alike. On the porch across the way lay a writhing man, torn by the rifle that had burst in his hands. The girl made a great effort to control herself. "Joaquin Smith's sorcery," she said dully. "And there goes hope as well." He started. "Hope? No! Wait, Vail." He rushed toward the milling group that surrounded bearded old Marcus Ormiston and the Confederation leaders. He plowed his way fiercely through, and seized the panic-stricken graybeard. "What now?" he roared. "What are you going to do?" "Do? Do?" The old man was beyond comprehending. "Yes, do! I'll tell you." He glared at the five leaders. "You'll carry through. Do you see? For powder and ball there's bow and sword, and just as good for the range we need. Gather your men! Gather your men and march!" And such, within the hour, was the decision. Hull marched first with the Ormiston men, and he carried with him the memory of Vail's farewell. It embarrassed him cruelly to be kissed thus in public, but there was great pleasure in the glimpse of Enoch Ormiston's sour face as he had watched her. The Ormiston men were first on the line of the Master's approach, and they filtered to their forest-hidden places as silently as foxes. Hull let his eyes wander back along the cut and what he saw pleased him, for no eye could have detected that along the deserted road lay ten thousand fighting men. They were good woodsmen too, these fellows from the upper rivers and the saltless seas. Down the way from Norse a single horseman came galloping. Old Marcus Ormiston recognized him, stood erect, and hailed him. They talked; Hull could hear the words. The Master had passed through Norse, pausing only long enough to notify the eldarch that henceforth his taxes must be transmitted to N'Orleans, and then had moved leisurely onward. No, there had been no sign of sorcery, nor had he even seen any trace of the witch Black Margot, but then, he had ridden away before the Master had well arrived. Or the Empire of the World!" Hull gripped his bow and set feather to cord. He knew well enough that the plan was to permit the enemy to pass unmolested until his whole line was within the span of the ambush, but the rumble of that distant song was like spark to powder. And now, far down the way beyond the cut, he saw the dust rising. Joaquin Smith was at hand. Then—the unexpected! Ever afterward Hull told himself that it should have been the expected, that the Master's reputation should have warned them that so simple a plan as theirs must fail. There was no time now for such vain thoughts, for suddenly, through the trees to his right, brown-clothed, lithe little men were slipping like charging shadows, horns sounding, whistles shrilling. The woods runners of the Master! Joaquin Smith had anticipated just such an ambush. Instantly Hull saw their own weakness. They were ten thousand, true enough, but here they were strung thinly over a distance of two miles, and now the woods runners were at a vast advantage in numbers, with the main body approaching. One chance! Fight it out, drive off the scouts, and retire into the woods. While the army existed, even though Ormiston fell, there was hope. He shouted, strung his arrow, and sent it flashing through the leaves. A bad place for arrows; their arching flight was always deflected by the tangled branches. He slung bow on shoulder and gripped his sword; close quarters was the solution, the sort of fight that made blood tingle and life seem joyous. Then—the second surprise! The woods runners had flashed their own weapons, little blunt revolvers. * But they sent no bullets; only pale beams darted through leaves and branches, faint blue streaks of light. Sorcery? And to what avail? He learned instantly. His sword grew suddenly scorching hot in his hands, and a moment later the queerest pain he had ever encountered racked his body. A violent, stinging, inward tingle that twitched his muscles and paralyzed his movements. A brief second and the shock ceased, but his sword lay smoking in the leaves, and his steel bow had seared his shoulders. Around him men were yelling in pain, writhing on the ground, running back into the forest depths. He cursed the beams; they flicked like sunlight through branched and leafy tangles where an honest arrow could find no passage. Yet apparently no man had been killed. Hands were seared and blistered by weapons that grew hot under the blue beams, bodies were racked by the torture that Hull could not know was electric shock, but none was slain. Hope flared again, and he ran to head off a retreating group. "To the road!" he roared. "Out where our arrows can fly free! Charge the column!" For a moment the group halted. Hull seized a yet unheated sword from someone, and turned back. "Come on!" he bellowed. "Come on! We'll have a fight of this yet!" Behind him he heard the trample of feet. The beams flicked out again, but he held his sword in the shadow of his own body, gritted his teeth, and bore the pain that twisted him. He rushed on; he heard his own name bellowed in the booming voice of File Ormson, but he only shouted encouragement and burst out into the full sunlight of the road. Below in the cut was the head of the column, advancing placidly. He glimpsed a silver helmeted, black haired man on a great white mare at its head, and beside him a slighter figure on a black stallion. Joaquin Smith! Hull roared down the embankment toward him. Four men spurred instantly between him and the figure with the silver helmet. A beam flicked; his sword scorched his skin and he flung it away. "Come on!" he bellowed. "Here's a fight!" Strangely, in curious clarity, he saw the eyes of the Empire men, a smile in them, mysteriously amused. No anger, no fear—just amusement. Hull felt a sudden surge of trepidation, glanced quickly behind him, and knew finally the cause of that amusement. No one had followed him; he had charged the Master's army alone! Now the fiercest anger he had ever known gripped Hull. Deserted! Abandoned by those for whom he fought. He roared his rage to the echoing bluffs, and sprang at the horseman nearest him. The horse reared, pawing the air. Hull thrust his mighty arms below its belly and heaved with a convulsion of his great muscles. Backward toppled steed and rider, and all about the Master was a milling turmoil where a man scrambled desperately to escape the clashing hooves. But Hull glimpsed Joaquin Smith sitting statuelike and smiling on his great white mare. He tore another rider from his saddle, and then caught from the corner of his eye, he saw the slim youth at the Master's side raise a weapon, coolly, methodically. For the barest instant Hull faced icy green eyes where cold, passionless death threatened. He flung himself aside as a beam spat smoking against the dust of the road. "Don't!" snapped Joaquin Smith, his low voice clear through the turmoil. "The youth is splendid!" But Hull had no mind to die uselessly. He bent, flung himself halfway up the bluff in a mighty leap, caught a dragging branch, and swung into the forest. A startled woods runner faced him; he flung the fellow behind him down the slope, and slipped into the shelter of leaves. "The wise warrior fights pride," he muttered to himself. "It's no disgrace for one man to run from an army." He was mountain bred. He circled silently through the forest, avoiding the woods runners who were herding the Confederation army back towards Ormiston. He smiled grimly as he recalled the words he had spoken to Vail. He had justified them; he had charged the army of the Master alone. Hull circled wide through the forest, and it took all his mountain craft to slip free through the files of woods runners. He came at last to the fields east of Ormiston, and there made the road, entering from the direction of Selui. Everywhere were evidences of rout. Wagons lay overturned, their teams doubtless used to further the escape of their drivers. Guns and rifles, many of them burst, littered the roadside, and now and again he passed black smoking piles and charred areas that marked the resting place of an ammunition cart. Yet Ormiston was little damaged. He saw the fire-gutted remains of a shed or two where powder had been stored, and down the street a house roof still smoked. But there was no sign of battle carnage, and only the crowded street gave evidence of the unusual. He found File Ormson in the group that stared across town to where the road from Norse elbowed east to enter. Hull had outsped the leisurely march of the Master, for there at the bend was the glittering army, now halted. Not even the woods runners had come into Ormiston town, for there they were too, lined in a brown-clad rank along the edge of the wood-lots beyond the nearer fields. They had made no effort, apparently, to take prisoners but had simply herded the terrified defenders into the village. Joaquin Smith had done it again; he had taken a town without a single death, or at least no casualties other than whatever injuries had come from bursting rifles and blazing powder. Suddenly Hull noticed something. "Where are the Confederation men?" he asked sharply. File Ormson turned gloomy eyes on him. "Gone. Flying back to Selui like scared gophers to their holes." He scowled, then smiled. "That was a fool's gesture of yours at Eaglefoot Flow, Hull. A fool's gesture, but brave." The youth grimaced wryly. "I thought I was followed." "And so you should have been, but that those fiendish ticklers tickled away our courage. But they can kill as well as tickle; when there was need of it before Memphis they killed quickly enough." Hull thought of the green-eyed youth. "I think I nearly learned that," he said smiling. Down the way there was some sort of stir. Hull narrowed his eyes to watch, and descried the silver helmet of the Master. He dismounted and faced someone; it was—yes, old Marcus Ormiston. He left File Ormson and shouldered his way to the edge of the crowd that circled the two. Joaquin Smith was speaking. "And," he said, "all taxes are to be forwarded to N'Orleans, including those on your own lands. Half of them I shall use to maintain my government, but half will revert to your own district, which will be under a governor I shall appoint in Selui when that city is taken. You are no longer eldarch, but for the present you may collect the taxes at the rate I prescribe." Old Marcus was bitterly afraid; Hull could see his beard waggling like an oriole's nest in a breeze. Yet there was a shrewd, bargaining streak in him. "You are very hard," he whined. "You left Pace Helm as eldarch undisturbed in Norse. Why do you punish me because I fought to hold what was mine? Why should that anger you so?" "I am not angry," said the Master passively. "I never blame any for fighting against me, but it is my policy to favor those eldarchs who yield peacefully." He paused. "Those are my terms, and generous enough." They were generous, thought Hull, especially to the people of Ormiston, who received back much less than half their taxes from the eldarch as roads, bridges, or wells. "My—my lands?" faltered the old man. "Keep what you till," said Joaquin Smith indifferently. "The rest of them go to their tenants." He turned away, placed foot to stirrup, and swung upon his great white mare. Hull caught his first fair glimpse of the conqueror. Black hair cropped below his ears, cool greenish grey eyes, a mouth with something faintly humorous about it. He was tall as Hull himself, more slender, but with powerful shoulders, and he seemed no older than the late twenties, or no more than thirty at most, though that was only the magic of Martin Sair, since more than eighty years had passed since his birth in the mountains of Mexico. He wore the warrior's garb of the southlands, a shirt of metallic silver scales, short thigh-length trousers of some shiny, silken material, cothurns on his feet. His bronzed body was like the ancient statues Hull had seen in Selui, and he looked hardly the fiend that most people thought him. A pleasant seeming man, save for something faintly arrogant in his face— no, not arrogant, exactly, but proud or confident, as if he felt himself a being driven by fate, as perhaps he was. He spoke again, now to his men. "Camp there," he ordered, waving at Ormiston square, "and there," pointing at a fallow field. "Do not damage the crops." He rode forward, and a dozen officers followed. "The Church," he said. A voice, a tense, shrieking voice behind Hull. "You! It is, Hull! It's you!" It was Vail, teary eyed and pale. "They said you were—" She broke off sobbing, clinging to him, while Enoch Ormiston watched sourly. He held her. "It seems I failed you," he said ruefully. "But I did do my best, Vail." "Failed? I don't care." She calmed. "I don't care, Hull, since you're here." "And it isn't as bad as it might be," he consoled. "He wasn't as severe as I feared." "Severe !" she echoed. "Do you believe those mild words of his, Hull? First our taxes then our lands, and next it will be our lives—or at least my father's life. Don't you understand? That was no eldarch from some enemy town, Hull—that was Joaquin Smith. Joaquin Smith! Do you trust him?" "Vail, do you believe that?" "Of course I believe it!" She began to sob again. "See how he has already won over half the town with—with that about the taxes. Don't you be won over, Hull. I—couldn't stand it!" "I will not," he promised. "He and Black Margot and their craft! I hate them, Hull. I—Look there! Look there!" He spun around. For a moment he saw nothing save the green-eyed youth who had turned death-laden eyes on him at Eaglefoot Flow, mounted on the mighty black stallion. Youth! He saw suddenly that it was a woman—a girl rather. Eighteen—twenty-five? He couldn't tell. Her face was averted as she scanned the crowd that lined the opposite side of the street, but the sunset fell on a flaming black mop of hair, so black that it glinted blue —an intense, unbelievable black. Like Joaquin Smith she wore only a shirt and very abbreviated shorts, but a caparison protected the slim daintiness of her legs from any contact with the mount's ribs. There was a curious grace in the way she sat the idling steed, one hand on its haunches, the other on withers, the bridle dangling loose. Her Spanish mother's blood showed only in the clear, transparent olive of her skin, and of course, in the startling ebony of her hair. "Black Margot!" Hull whispered, "Brazen! Half naked! What's so beautiful about her?" As if she heard his whisper, she turned suddenly, her emerald eyes sweeping the crowd about him, and he felt his question answered. Her beauty was starkly incredible—audacious, outrageous. It was more than a mere lack of flaws; it was a sultry, flaming positive beauty with a hint of sullenness in it. The humor of the Master's mouth lurked about hers as mockery; her perfect lips seemed always about to smile, but to smile cruelly and sardonically. Hers was a ruthless and pitiless perfection, but it was nevertheless perfection, even to the faintly Oriental cast given by her black hair and sea-green eyes. Those eyes met Hull's and it was almost as if he heard an audible click. He saw recognition in her face, and she passed her glance casually over his mighty figure. He stiffened, stared defiantly back, and swept his own gaze insolently over her body from the midnight hair to the diminutive cothurns on her feet. If she acknowledged his gaze at all, it was by the faintest of all possible smiles of mockery as she rode coolly away toward Joaquin Smith. Vail was trembling against him, and it was a great relief to look into her deep but not at all mysterious blue eyes, and to see the quite understandable loveliness of her pale features. What if she hadn't the insolent brilliance of the Princess, he thought fiercely. She was sweet and honest and loyal to her beliefs, and he loved her. Yet he could not keep his eyes from straying once more to the figure on the black stallion. "She—she smiled at you, Hull!" gasped Vail. "I'm frightened. I'm terribly frightened." His fascination was yielding now to a surge of hatred for Joaquin Smith, for the Princess, for the whole Empire. It was Vail he loved, and she was being crushed by these. An idea formed slowly as he stared down the street to where Joaquin Smith had dismounted and was now striding into the little church. He heard an approving murmur sweep the crowd, already half won over by the distribution of land. That was simply policy, the Master's worshipping in Ormiston church, a gesture to the crowd. He lifted the steel bow from his back and bent it. The spring was still in it; it had been heated enough to scorch his skin but not enough to untemper it. "Wait here!" he snapped to Vail, and strode up the street toward the church. Outside stood a dozen Empire men, and the Princess idled on her great black horse. He slipped across the churchyard, around behind where a tangle of vines stretched toward the roof. Would they support his weight? They did, and he pulled himself hand over hand to the eaves, and thence to the peak. The spire hid him from the Master's men, and not one of the Ormiston folk glanced his way. He crept forward to the base of the steeple. Now he must leave the peak and creep precariously along the steep slope around it. He reached the street edge and peered cautiously over. The Master was still within. Against his will he glanced at Black Margot, and even put cord to feather and sighted at her ivory throat. But he could not. He could not loose the shaft. Below him there was a stir. Joaquin Smith came out and swung to his white horse. Now was the moment. Hull rose to his knees, 'hoping that he could remain steady on the sharp pitch of the roof. Carefully, carefully, he drew the steel arrow back. There was a shout. He had been seen, and a blue beam sent racking pain through his body. For an instant he bore it, then loosed his arrow and went sliding down the roof edge and over. He fell on soft loam. A dozen hands seized him, dragged him upright, thrust him out into the street. He saw Joaquin Smith still on his horse, but the glistening arrow stood upright like a plume in his silver helmet, and a trickle of blood was red on his cheek. But he wasn't killed. He raised the helmet from his head, waved aside the cluster of officers, and with his own hands bound a white cloth about his forehead. Then he turned cool grey eyes on Hull. "You drive a strong shaft," he said, and then recognition flickered in his eyes. "I spared your life some hours ago, did I not?" "Why," resumed the Master, "do you seek to kill me after your eldarch has made peace with me? You are part of the Empire now, and this is treason." "I made no peace!" growled Hull. "But your leader did, thereby binding you. Hull could not keep his gaze from the emerald eyes of the Princess, who was watching him without expression save faint mockery. "Have you nothing to say," asked Joaquin Smith. The Master's eyes slid over him. "Are you Ormiston born?" he asked. "What is your name?" No need to bring troubles on his friends. "No," said Hull. "I am called Hull Tarvish." The conqueror turned away. "Lock him up," he ordered coolly. "Let him make whatever preparations his religion requires, and then—execute him." Above the murmur of the crowd Hull heard Vail Ormiston's cry of anguish. He turned to smile at her, watched her held by two Empire men as she struggled to reach him. "I'm sorry," he called gently. "I love you, Vail." Then he was being thrust away down the street. He was pushed into Hue Helm's stone-walled tool shed. It had been cleared of everything, doubtless for some officer's quarters. Hull drew himself up and stood passively in the gathering darkness where a single shaft of sunset light angled through the door, before which stood two grim Empire men. One of them spoke. "Keep peaceful, Weed,"* he said in his N'Orleans drawl. "Go ahead with your praying, or whatever it is you do." "I do nothing," said Hull. "The mountainies believe that a right life is better than a right ending, and right or wrong a ghost's but a ghost anyway." The guard laughed. "And a ghost you'll be." "If a ghost I'll be," retorted Hull, turning slowly toward him, "I'd sooner turn one—fighting!" He sprang suddenly, crashed a mighty fist against the arm that bore the weapon, thrust one guard upon the other, and overleaped the tangle into the dusk. As he spun to circle the house, something very hard smashed viciously against the back of his skull, sending him sprawling half dazed against the wall. After a brief moment Hull sprawled half stunned, then his muscles lost their paralysis and he thrust himself to his feet, whirling to face whatever assault threatened. In the doorway the guards still scrambled, but directly before him towered a rider on a black mount, and two men on foot flanked him. The rider, of course, was the Princess, her glorious green eyes luminous as a cat's in the dusk as she slapped a short sword into its scabbard. It was a blow from the flat of its blade that had felled him. She held now the blunt weapon of the blue beam. It came to him that he had never heard her speak, but she spoke now in a voice low and liquid, yet cold, cold as the flow of an ice-crusted winter stream. "Stand quiet, Hull Tarvish," she said. "One flash will burst that stubborn heart of yours forever." Perforce he stood quiet, his back to the wall of the shed. He had no doubt at all that the Princess would kill him if he moved; he couldn't doubt it with her icy eyes upon him. He stared sullenly back, and a phrase of Old Einar's came strangely to his memory. "Satanically beautiful," the old man had called her, and so she was. Hell or the art of Martin Sair had so fashioned her that no man could gaze unmoved on the false purity of her face, no man at least in whom flowed red blood. She spoke again, letting her glance flicker disdainfully over the two appalled guards. "The Master will be pleased," she said contemptuously, "to learn that one unarmed Weed outmatches two men of his own cohort." The nearer man faltered, "But your Highness, he rushed us unexpect—"
"No matter," she cut in, and turned back to Hull. For the first time now he really felt the presence of death as she said coolly, "I am minded to kill you." "Then do it!" he snapped. "I came here to watch you die," she observed calmly. "It interests me to see men die, boldly or cowardly or resignedly. I think you would die boldly." It seemed to Hull that she was deliberately torturing him by this procrastination. "Try me!" he growled. "But I think also," she resumed, "that your living might amuse me more than your death, and" for the first time there was a breath of feeling in her voice "God knows I need amusement!" Her tones chilled again. "I give you your life." "Your Highness," muttered the cowed guard, "the Master has ordered —"
"I countermand the orders," she said shortly. And then to Hull. "You are a fighter. Are you also a man of honor?" "If I'm not," he retorted, "the lie that says I am would mean nothing to me." She smiled coldly. "Well, I think you are, Hull Tarvish. You go free on your word to carry no weapons, and your promise to visit me this evening in my quarters at the eldarch's home." She paused. "Well?" "And I take it." She crashed her heels against the ribs of the great stallion, and the beast reared and whirled. "Away, all of you!" she ordered. "You two, carry tub and water for my bath." She rode off toward the street. Hull let himself relax against the wall with a low "whew!" Sweat started on his cold forehead, and his mighty muscles felt almost weak. It wasn't that he had feared death, he told himself, but the strain of facing those glorious, devilish emerald eyes, and the cold torment of the voice of Black Margot, and the sense of her taunting him, mocking him, even her last careless gesture of freeing him. He drew himself erect. After all, fear of death or none, he loved life, and let that be enough. He walked slowly toward the street. Across the way lights glowed in Marcus Orison's home, and he wondered if Vail were there, perhaps serving the Princess Margaret as he had so lately suggested the contrary. He wanted to find Vail; he wanted to use her cool loveliness as an antidote for the dark poison of the beauty he had been facing. And then, at the gate, he drew back suddenly. A group of men in Empire garb came striding by, and among them, helmetless and with his head bound, moved the Master. His eyes fell on Hull. He paused suddenly and frowned. "You again!" he said. "How is it that you still live, Hull Tarvish?" The frown faded. "So," said Joaquin Smith slowly, "Margaret takes it upon herself to interfere somewhat too frequently. I suppose she also freed you?" "Yes, on my promise not to bear arms." There was a curious expression in the face of the conqueror. "Well," he said almost gently, "it was not my intention to torture you, but merely to have you killed for your treason. It may be that you will soon wish that my orders had been left unaltered." He strode on into the eldarch's dooryard, with his silent men following. Hull turned his steps toward the center of the village. Everywhere he passed Empire men scurrying about the tasks of encampment, and supply wagons rumbled and jolted in the streets. He saw files of the soldiers passing slowly before cook-wagons and the smell of food floated on the air, reminding him that he was ravenously hungry. He hurried toward his room beside File Ormiston's shop, and there, tragic-eyed and mist-pale, he found Vail Ormiston. She was huddled on the doorstep with sour Enoch holding her against him. It was Enoch who first perceived Hull, and his jaw dropped and his eyes bulged, and a gurgling sound issued from his throat. And Vail looked up with uncomprehending eyes, stared for a moment without expression, and then, with a little moan, crumpled and fainted. She was unconscious only a few moments, scarcely long enough for Hull to bear her into his room. There she lay now on his couch, clinging to his great hand, convinced at last of his living presence. "I think," she murmured, "that you're as deathless as Joaquin Smith, Hull. I'll never believe you dead again. Tell me—tell me how it happened." He told her. "Black Margot's to thank for it," he finished. But the very name frightened Vail. "She means evil, Hull. She terrifies me with her witch's eyes and her hell-stained hair. I haven't even dared go home for fear of her." He laughed. "Don't worry about me, Vail. I'm safe enough." Enoch cut in. "Here's one for the Harriers, then," he said sourly. "The pack needs him." "The Harriers?" Hull looked up puzzled. "Oh, Hull, yes!" said Vail. "File Ormson's been busy. The Harriers are what's left of the army—the better citizens of Ormiston. The Master's magic didn't reach beyond the ridge, and over the hills there's still powder and rifles. And the spell is no longer in the valley, either. One of the men carried a cup of powder across the ridge, and it didn't burn." The better citizens, Hull thought smiling. She meant, of course, those who owned land and feared a division of it such as Marcus Ormiston had suffered. But aloud he said only, "How many men have you?" "Oh, there'll be several hundred with the farmers across the hills." She looked into his eyes, "I know it's a forlorn hope, Hull, but—we've got to try. You'll help, won't you?" "Of course. But all your Harriers can attempt is raids. They can't fight the Master's army." "I know. I know it, Hull. It's a desperate hope." "Desperate?" said Enoch suddenly. "Hull, didn't you say you were ordered to Black Margot's quarters this evening?" "Then—see here! You'll carry a knife in your armpit. Sooner or later she'll want you alone with her, and when that happens, you'll slide the knife quietly into her ruthless heart! There's a hope for you—if you've courage!" "Courage!" he growled. "To murder a woman "
"Devil or not, what's the good of it? It's Joaquin Smith that's building the Empire, not the Princess." "Yes," said Enoch, "but half his power is the art of the witch. Once she's gone the Confederation could blast his army like ducks in a frog pond." "It's true!" gasped Vail. "What Enoch says is true!" Hull scowled. "I swore not to bear weapons!" "Swore to her!" snapped Enoch. "That needn't bind you. "My word's given," said Hull firmly. "I do not lie." Vail smiled. "You're right," she whispered, and as Enoch's face darkened, "I love you for it, Hull." "Then," grunted Enoch, "if it's not lack of courage, do this. Lure her somehow across the west windows. We can slip two or three Harriers to the edge of the woodlot, and if she passes a window with the light behind her —well, they won't miss." "Oh, I won't," said Hull wearily. "I won't fight women, nor betray even Black Margot to death." But Vail's blue eyes pleaded. "That won't be breaking your word, Hull. Please. It isn't betraying a woman. She's a sorceress. She's evil. Please, Hull." Bitterly he yielded. "I'll try, then." He frowned gloomily. "She saved my life, and—Well, which room is her's?" "My father's. Mine is the western chamber, which she took for her— her maid," Vail's eyes misted at the indignity of it. "We," she said, "are left to sleep in the kitchen." An hour later, having eaten, he walked somberly home with Vail while Enoch slipped away toward the hills. There were tents in the dooryard, and lights glowed in every window, and before the door stood two dark Empire men who passed the girl readily enough, but halted Hull with small ceremony. Vail cast him a wistful backward glance as she disappeared toward the rear, and he submitted grimly to the questioning of the guards. "To see the Princess Margaret." One of the men stepped to his side and ran exploratory hands about his body. "Orders of Her Highness," he explained gruffly. Hull smiled. The Princess had not trusted his word too implicitly. In a moment the fellow had finished his search and swung the door open. Hull entered. He had never seen the interior of the house, and for a moment its splendor dazzled him. Carved ancient furniture, woven carpets, intricately worked standards for the oil lamps, and even—for an instant he failed to comprehend it—a full-length mirror of ancient workmanship wherein his own image faced him. Until now he had seen only bits and fragments of mirrors. To his left a guard blocked an open door whence voices issued. Old Marcus Ormiston's voice. "But I'll pay for it. I'll buy it with all I have." His tones were wheedling. "No." Cool finality in the voice of Joaquin Smith. "Long ago I swore to Martin Sair never to grant immortality to any who have not proved themselves worthy." A note of sarcasm edged his voice. "Go prove yourself deserving of it, old man, in the few years left to you." Hull sniffed contemptuously. There seemed something debased in the old man's whining before his conqueror. "The Princess Margaret?" he asked, and followed the guard's gesture. Upstairs was a dimly lit hall where another guard stood silently. Hull repeated his query, but in place of an answer came the liquid tones of Margaret herself. "Let him come in, Corlin." A screen within the door blocked sight of the room. Hull circled it, steeling himself against the memory of that soul-burning loveliness he remembered. But his defense was shattered by the shock that awaited him. The screen, indeed, shielded the Princess from the sight of the guard in the hall, but not from Hull's eyes. He stared utterly appalled at the sight of her lying in complete indifference in a great tub of water, while a fat woman scrubbed assiduously at her bare body. He could not avoid a single glimpse of her exquisite form, then he turned and stared deliberately from the east windows, knowing that he was furiously crimson even to his shoulders. "Oh, sit down!" she said contemptuously. "This will be over in a moment." He kept his eyes averted while water splashed and a towel whisked sibilantly. When he heard her footsteps beside him he glanced up tentatively, still fearful of what he might see, but she was covered now in a full robe of shiny black and gold that made her seem taller, though its filmy delicacy by no means concealed what was beneath. Instead of the cothurns she wore when on the march, she had slipped her feet into tiny high-heeled sandals that were reminiscent of the footgear he had seen in ancient pictures. The black robe and her demure coif of short ebony hair gave her an appearance of almost nunlike purity, save for the green hell-fires that danced in her eyes. In his heart Hull cursed that false aura of innocence, for he felt again the fascination against which he had steeled himself. "So," she said. "You may sit down again. I do not demand court etiquette in the field." She sat opposite, and produced a black cigarette, lighting it at the chimney of the lamp on the table. Hull stared; not that he was unaccustomed to seeing women smoke, for every mountainy woman had her pipe, and every cottage its tobacco patch, but cigarettes were new to him. "Now," she said with a faintly ironic smile, "tell me what they say of me here." "And do they hate me?" "Hate you?" he echoed thoughtfully. "At least they will fight you and the Master to the last feather on the last arrow." "Of course. The young men will fight—except those that Joaquin has bought with the eldarch's lands—because they know that once within the Empire, fighting is no more to be had. No more joyous, thrilling little wars between the cities, no more boasting and parading before the pretty provincial girls " She paused. "And you, Hull Tarvish—what do you think of me?" "I call you witch for other reasons." "There is no magic," said Hull, echoing the words of old Einar in Selui. "There is only knowledge." The Princess looked narrowly at him. "A wise thought for one of you," she murmured, and then, "You came weaponless." "You owe me that. I spared your life." "And I," declared Hull defiantly, "spared yours. I could have sped an arrow through that white throat of yours, there on the church roof. I aimed one." She smiled. "What held you?" "I do not fight women." He winced as he thought of what mission he was on, for it belied his words. "Tell me," she said, "was that the eldarch's pretty daughter who cried so piteously after you there before the church?" "Yes." This was the opening he had sought, but it came bitterly now, facing her. He took the opportunity grimly. "I should like to ask one favor." "I should like to see"—lies were not in him but this was no lie —"the chamber that was to have been our bridal room. The west chamber." That might be—should be—truth. The Princess laughed disdainfully. "Go see it then." For a moment he feared, or hoped, perhaps, that she was going to let him go alone. Then she rose and followed him to the hall, and to the door of the west chamber. Hull paused at the door of the west chamber to permit the Princess to enter. For the merest fraction of a second her glorious green eyes flashed speculatively to his face, then she stepped back. "You first, Weed," she commanded. He did not hesitate. He turned and strode into the room, hoping that the Harrier riflemen, if indeed they lurked in the copse, might recognize his mighty figure in time to stay their eager trigger fingers. His scalp prickled as he moved steadily across the window, but nothing happened. Behind him the Princess laughed softly. "I have lived too long in the aura of plot and counterplot in N'Orleans," she said. "I mistrust you without cause, honest Hull Tarvish." Her words tortured him. He turned to see her black robe mold itself to her body as she moved, and, as sometimes happens in moments of stress, he caught an instantaneous picture of her with his senses so quickened that it seemed as if she, himself, and the world were frozen into immobility. He remembered her forever as she was then, with her limbs in the act of striding, her green eyes soft in the lamplight, and her perfect lips in a smile that had a coloring of wistfulness. Witch and devil she might be, but she looked like a dark-haired angel, and in that moment his spirit revolted. "No!" he bellowed, and sprang toward her, striking her slim shoulders with both hands in a thrust that sent her staggering back into the hallway, there to sit hard and suddenly on the floor beside the amazed guard. She sprang up instantly, and there was nothing angelic now in 'her face. "You—hurt me!" she hissed. "Me! Now, I'll—" She snatched the guard's weapon from his belt, thrust it full at Hull's chest, and sent the blue beam humming upon him. It was pain far worse than that at Eaglefoot Flow. He bore it stolidly, grinding into silence the groan that rose in his throat, and in a moment she flicked it off and slapped it angrily into the guard's holster. "Treachery again!" she said. "I won't kill you, Hull Tarvish. I know a better way." She whirled toward the stair-well. "Lebeau!" she called. "Lebeau! There's —" She glanced sharply at Hull, and continued, "II y a des tirailleurs dans le bois. Je vais les tirer en avant! "* It was the French of N'Orleans, as incomprehensible to Hull as Aramaic. She spun back. "Sora!" she snapped, and then, as the fat woman appeared, "Never mind. You're far too heavy." Then back to Hull. "I've a mind," she blazed, "to strip the Weed clothes from the eldarch's daughter and send her marching across the window!" He was utterly appalled. "She—she was in town!" he gasped, then fell silent at the sound of feet below. "Well, there's no time," she retorted. "So, if I must—" She strode steadily into the west chamber, paused a moment, and then stepped deliberately in front of the window! Hull was aghast. He watched her stand so that the lamplight must have cast her perfect silhouette full on the pane, stand tense and motionless for the fraction of a breath, and then leap back so sharply that her robe billowed away from her body. She had timed it to perfection. Two shots crashed almost together, and the glass shattered. And then, out in the night, a dozen beams crisscrossed, and, thin and clear in the silence after the shots, a yell of mortal anguish drifted up, and another, and a third. "There are snipers in the copse. I'll draw them out!" The Princess Margaret smiled in malice, and licked a crimson drop from a finger gashed by flying glass. "Your treachery reacts," she said in the tones of a sneer. "Instead of my betrayal, you have betrayed your own men." "I need no accusation from you," he said gloomily. "I am my own accuser, and my own judge. Yes, and my own executioner as well. I will not live a traitor." She raised her dainty eyebrows, and blew a puff of grey smoke from the cigarette still in her hand. "So strong Hull Tarvish will die a suicide," she remarked indifferently. "I had intended to kill you now. Should I leave you to be your own victim?" He shrugged. "What matter to me?" "Well," she said musingly, "you're rather more entertaining than I had expected. You're strong, you're stubborn, and you're dangerous. I give you the right to do what you wish with your own life, but"—her green eyes flickered mockingly—"if I were Hull Tarvish, I should live on the chance of justifying myself. You can wipe out the disgrace of your weakness by an equal courage. You can sell your life in your own cause, and who knows? —perhaps for Joaquin's—or mine!" He chose to ignore the mockery in her voice. "Perhaps," he said grimly, "I will." "Why, then, did you weaken, Hull Tarvish? You might have had my life." "I do not fight women," he said despondently. "I looked at you—and turned weak." A question formed in his mind. "But why did you risk your life before the window? You could have had fifty woods runners scour the copse. That was brave, but unnecessary." She smiled, but there was a shrewd narrowness in her eyes. "Because so many of these villages are built above the underground ways of the Ancients —the subways, the sewers. How did I know but that your assassins might slip into some burrow and escape? It was necessary to lure them into disclosure." Hull shadowed the gleam that shot into his own eyes. He remembered suddenly the ancient sewer in which the child Vail had wandered, whose entrance was hidden by blackberry bushes. Then the Empire men were unaware of it! He visioned the Harriers creeping through it with bow and sword— yes, and rifle, now that the spell was off the valley—springing suddenly into the center of the camp, finding the Master's army, sleeping, disorganized, unwary. What a plan for a surprise attack! "Your Highness," he said grimly, "I think of suicide no more, and unless you kill me now, I will be a bitter enemy to your Empire army." "Perhaps less bitter than you think," she said softly. "See, Hull, the only three that know of your weakness are dead. No one can name you traitor or weakling." "But I can," he returned somberly. "And you." "Not I, Hull," she murmured. "I never blame a man who weakens because of me—there have been many. Men as strong as you, Hull, and some that the world still calls great." She turned toward her own chamber. "Come in here," she said in altered tones. "I will have some wine. Sora!" As the fat woman padded off, she took another cigarette and lit it above the lamp, wrinkling her dainty nose distastefully at the night-flying insects that circled it. "What a place!" she snapped impatiently. "It is the finest house I have ever seen," said Hull stolidly. She laughed. "It's a hovel. I sigh for the day we return to N'Orleans, where windows are screened, where water flows hot at will, where lights do not flicker as yellow oil lamps nor send heat to stifle one. Would you like to see the Great City, Hull?" "What if I say you may?" "What could keep me from it if I go in peace?" She shrugged. "Oh, you can visit N'Orleans, of course, but suppose I offered you the chance to go as the—the guest, we'll say, of the Princess Margaret. What would you give for that privilege?" Was she mocking him again? "What would you ask for it?" he rejoined guardedly. "Oh, your allegiance, perhaps. Or perhaps the betrayal of your little band of Harriers, who will be the devil's own nuisance to stamp out of these hills." He looked up startled that she knew the name. "The Harriers? How?" She smiled. "We have friends among the Ormiston men. Friends bought with land," she added contemptuously. "But what of my offer, Hull?" He scowled. "You say as your guest. What am I to understand by that?" She leaned across the table, her exquisite green eyes on his, her hair flaming blue-black, her perfect lips in a faint smile. "What you please, Hull. Whatever you please." Anger was rising. "Do you mean," he asked huskily, "that you'd do that for so small a thing as the destruction of a little enemy band? You, with the whole Empire at your back?" She nodded. "It saves trouble, doesn't it?" "And honesty, virtue, honor, mean as little to you as that? Is this one of your usual means of conquest? Do you ordinarily sell your—your favors for—?" "Not ordinarily," she interrupted coolly. "First I must like my co-partner in the trade. You, Hull—I like those vast muscles Of yours, and your stubborn courage, and your slow, clear mind. You are not a great man, Hull, for your mind has not the cold fire of genius, but you are a strong one, and I like you for it." "Like me!" he roared, starting up in his chair. "Yet you think I'll trade what honor's left me for—that! You think I'll betray my cause! You think—Well, you're wrong, that's all. You're wrong!" She shook her head, smiling. "No. I wasn't wrong, for I thought you wouldn't." "Oh, you did!" he snarled. "Then what if I'd accepted? What would you have done then?" "What I promised." She laughed at his angry, incredulous face. "Don't look so shocked, Hull. I'm not little Vail Ormiston. I'm the Princess Margaret of N'Orleans, called Margaret the Divine by those who love me, and by those who hate me called—Well, you must know what my enemies call me." "I do!" he blazed. "Black Margot, I do!" "Black Margot!" she echoed smiling. "Yes, so called because a poet once amused me, and because there was once a very ancient, very great French poet named François Villon, who loved a harlot called Black Margot." She sighed. "But my poet was no Villon; already his works are nearly forgotten." "A good name!" he rasped. "A good name for you!" "Doubtless. But you fail to understand, Hull. I'm an Immortal. My years are three times yours. Would you have me follow the standards of death-bound Vail Ormiston?" "Yes! By what right are you superior to all standards?" Her lips had ceased to smile, and her deep green eyes turned wistful. "By the right that I can act in no other way, Hull," she said softly. A tinge of emotion quavered in her voice. "Immortality!" she whispered. "Year after year after year of sameness, tramping up and down the world on conquest! What do I care for conquest? I have no sense of destiny like Joaquin, who sees before him Empire—Empire—Empire, ever larger, ever growing. What's Empire to me? And year by year I grow bored until fighting, killing, danger, and love are all that keep me breathing!" His anger had drained away. He was staring at her aghast, appalled. "And then they fail me!" she murmured. "When killing palls and love grows stale, what's left? Did I say love? How can there be love for me when I know that if I love a man, it will be only to watch him age and turn wrinkled, weak, and flabby? And when I beg Joaquin for immortality for him, he flaunts before me that promise of his to Martin Sair, to grant it only to those already proved worthy. By the time a man's worthy he's old." She went on tensely, "I tell you, Hull, that I'm so friendless and alone that I envy you death-bound ones! Yes, and one of these days I'll join you!" He gulped. "My God!" he muttered. "Better for you if you'd stayed in your native mountains with friends, home, husband, and children." "Children!" she echoed, her eyes misting with tears. "Immortals can't have children. They're sterile; they should be nothing but brains like Joaquin and Martin Sair, not beings with feelings—like me. Sometimes I curse Martin Sair and his hard rays. I don't want immortality; I want life!" Hull found his mind in a whirl. The impossible beauty of the girl he faced, her green eyes now soft and moist and unhappy, her lips quivering, the glisten of a tear on her cheek—these things tore at him so powerfully that he scarcely knew his own allegiance. "God!" he whispered. "I'm sorry!" "And you, Hull—will you help me—a little?" "Can't we be—something else?" A sob shook her. "How can we be?" he groaned. Suddenly some quirk to her dainty lips caught his attention. He stared incredulously into the green depths of her eyes. It was true. There was laughter there. She had been mocking him! And as she perceived his realization, her soft laughter rippled like rain on water. "You—devil!" he choked. "You black witch! I wish I'd let you be killed!" "Oh, no," she said demurely. "Look at me, Hull." The command was needless. He couldn't take his fascinated gaze from her exquisite face. "Do you love me, Hull?" "I love Vail Ormiston," he rasped. "But do you love me as well?" He groaned. "This is bitterly unfair," he muttered. She knew what he meant. He as crying out against the circumstances that had brought the Princess Margaret—the most brilliant woman of all that brilliant age, and one of the most brilliant of any age—to flash all her fascination on a simple mountainy from Ozarky. It wasn't fair; her smile admitted it, but there was triumph there, too. "May I go?" he asked stonily. She nodded. "But you will be a little less my enemy, won't you, Hull?" He rose. "Whatever harm I can do your cause," he said, "that harm will I do. I will not be twice a traitor." But he fancied a puzzling gleam of satisfaction in her green eyes at his words. Hull looked down at noon over Ormiston valley, where Joaquin Smith was marching. At his side Vail paused, and together they gazed silently over Selui road, now black with riding men and rumbling wagons on their way to attack the remnant of the Confederation army in Selui. But Ormiston was not entirely abandoned, for three hundred soldiers and two hundred horsemen remained to deal with the Harriers, under Black Margot herself. It was not the policy of the Master to permit so large a rebel band to gather unopposed in conquered territory; within the Empire, despite the mutual hatred among rival cities, there existed a sort of enforced peace. "Our moment comes tonight," Hull said soberly. "We'll never have a better chance than now, with our numbers all but equal to theirs, and surprise on our side." Vail nodded. "The ancient tunnel was a bold thought, Hull. The Harriers are shoring up the crumbled places. Father is with them." "He shouldn't be. The aged have no place in the field." "But this is his hope, Hull. He lives for this." "Small enough hope! Suppose we're successful, Vail. What will it mean save the return of Joaquin Smith and his army? Common sense tells me this is a fool's hunt, and if it were not for you and the chance of fairer fighting than we've had until now—well, I'd be tempted to concede the Master his victory." "Oh, no!" cried Vail. "If our success means the end of Black Margot, isn't that enough? Besides, you know that half the Master's powers are the work of the witch. Enoch—poor Enoch—said so." Hull winced. Enoch had been one of the three marksmen slain outside the west windows, and the girl's words brought memory of his own part in that. But her words pricked painfully in yet another direction, for the vision of the Princess that had plagued him all night long still rose powerfully in his mind, nor could he face the mention of her death unmoved. But Vail read only distress for Enoch in his face. "Enoch," she repeated softly. "He loved me in his sour way, Hull, but once I had known you, I had no thoughts for him." Hull slipped his arm about her, cursing himself that he could not steal his thought away from Margaret of N'Orleans, because it was Vail he loved, and Vail he wanted to love. Whatever spell the Princess had cast about him, he knew her to be evil, ruthless, and inhumanly cold—a sorceress, a devil. But he could not blot her Satanic loveliness from his inward gaze. "Well," he sighed, "let it be tonight, then. Was it four hours past sunset? Good. The Empire men should be sleeping or gaming in Tigh's tavern by that time. It's for us to pray for our gunpowder." "Gunpowder? Oh, but didn't you hear what I told File Ormson and the Harriers, back there on the ridge? The casters of the spell are gone; Joaquin Smith has taken them to Selui. I watched and listened from the kitchen this morning." "Yes. They called them reson—resators —"
"Resonators," said Hull, recalling Old Einar's words. "Something like that. There were two of them, great iron barrels on swivels, full of some humming and clicking magic, and they swept the valley north and south, and east and west, and over toward Norse there was the sound of shots and the smoke of a burning building. They loaded them on wagons and dragged them away toward Selui." "They didn't cross the ridge with their spell," said Hull. * "The Harriers still have powder." "Yes," murmured Vail, drawing his arm closer about her. "Tell me," she said suddenly, "what did she want of you last night?" Hull grimaced. He had told Vail little enough of that discreditable evening, and he had been fearing her question. "Treason," he said finally. "She wanted me to betray the Harriers." "You? She asked that of you?" "Do you think I would?" countered Hull. "I know you never would. But what did she offer you for betrayal?" Again he hesitated. "A great reward," he answered at last. "A reward out of all proportion to the task." "Tell me, Hull, what is she like face to face?" "A demon. She isn't exactly human." "But in what way? Men say so much of her beauty, of her deadly charm. Hull —did you feel it?" She sighed, and drew yet closer. "I think you're the strongest man in the world, Hull. The very strongest." "I'll need to be," he muttered, staring gloomily over the valley. Then he smiled faintly as he saw men plowing, for it was late in the season for such occupation. Old Marcus Ormiston was playing safe; remembering the Master's words, he was tilling every acre across which a horse could drag a blade. Vail left him in Ormiston village and took her way hesitantly homeward. Hull did what he could about the idle shop, and when the sun slanted low, bought himself a square loaf of brown bread, a great slice of cheese, and a bottle of the still, clear wine of the region. It was just as he finished his meal in his room that a pounding on the door of the shop summoned him. It was an Empire man. "Hull Tarvish?" he asked shortly. At Hull's nod he continued, "From Her Highness," and handed him a folded slip of black paper. The mountain youth stared at it. On one side, in raised gold, was the form of a serpent circling a globe, its tail in its mouth—the Midgard Serpent. He slipped a finger through the fold, opened the message, and squinted helplessly at the characters written in gold on the black inner surface. "This scratching means nothing to me," he said. The Empire man sniffed contemptuously. "I'll read it," he said, taking the missive. "It says, 'Follow the messenger to our quarters,' and it's signed Margarita Imperii Regina, which means Margaret, Princess of the Empire. Is that plain?" He handed back the note. "I've been looking an hour for you." "Suppose I won't go," growled Hull. "This isn't an invitation, Weed. It's a command." Hull shrugged. He had small inclination to face Black Margot again, especially with his knowledge of the Harriers' plans. Her complex personality baffled and fascinated him, and he could not help fearing that somehow, by some subtle art, she might wring that secret from him. Torture wouldn't force it out of him, but those green eyes might read it. Yet—better to go quietly than be dragged or driven; he grunted assent and followed the messenger. He found the house quiet. The lower room where Joaquin Smith had rested was empty now, and he mounted the stairs again steeling himself against the expected shock of Black Margot's presence. This time, however, he found her clothed, or half clothed by Ormiston standards, for she wore only the diminutive shorts and shirt that were her riding costume, and her dainty feet were bare. She sat in a deep chair beside the table, a flagon of wine at hand and a black cigarette in her fingers. Her jet hair was like a helmet of ebony against the ivory of her forehead and throat, and her green eyes like twin emeralds. "Sit down," she said as he stood before her. "The delay is your loss, Hull. I would have dined with you." "I grow strong enough on bread and cheese," he growled. "You seem to." Fire danced in her eyes. "Hull, I am as strong as most men, but I believe those vast muscles of yours could overpower me as if I were some shrinking provincial girl. And yet—"
"And yet you are much like my black stallion Eblis. Your muscles are nearly as strong, but like him, I can goad you, drive you, lash you, and set you galloping in whatever direction I choose." "Can you?" he snapped. "Don't try it." But the spell of her unearthly beauty was hard to face. "But I think I shall try it," she cooed gently. "Hull, do you ever lie?" "Shall I make you lie, then, Hull? Shall I make you swear such falsehoods that you will redden forever afterward at the thought of them? Shall I?" She smiled, then in altered tones, "Do you love me, Hull?" "Love you? I hate—" He broke off suddenly. "Do you hate me, Hull?" she asked gently. "No," he groaned at last. "No, I don't hate you." "But do you love me?" Her face was saint-like, earnest, pure, even the green eyes were soft now as the green of spring. "Tell me, do you love me?" "No!" he ground out savagely, then flushed crimson at the smile on her lips. "That isn't a lie!" he blazed. "This sorcery of yours isn't love. I don't love your beauty. It's unnatural, hellish, and the gift of Martin Sair. It's a false beauty, like your whole life!" "Martin Sair had little to do with my appearance," she said gently. "What do you 'feel for me, Hull, if not love?" "I—don't know. I don't want to think of it!" He clenched a great fist. "Love? Call it love if you wish, but it's a hell's love that would find satisfaction in killing you!" But here his heart revolted again. "That isn't so," he ended miserably. "I couldn't kill you." "Suppose," she proceeded gently, "I were to promise to abandon Joaquin, to be no longer Black Margot and Princess of the Empire, but to be only— Hull Tarvish's wife. Between Vail and me, which would you choose?" He said nothing' for a moment. "You're unfair," he said bitterly at last. "Is it fair to compare Vail and yourself? She's sweet and loyal and innocent, but you—you are Black Margot!" "Nevertheless," she said calmly, "I think I shall compare us. Sora!" The fat woman appeared. "Sora, the wine is gone. Send the eldarch's daughter here with another bottle and a second goblet." Hull stared appalled. "What are you going to do?" "No harm to your little Weed. I promise no harm." "But—" He paused. Vail's footsteps sounded on the stairs, and she entered timidly, bearing a tray with a bottle and a metal goblet. He saw her start as she perceived him, but she only advanced quietly, set the tray on the table, and backed toward the door. "Wait a moment," said the Princess. She rose and moved to Vail's side as if to force the comparison on Hull. He could not avoid it; he hated himself for the thought, but it came regardless. Barefooted, the Princess Margaret was exactly the height of Vail in her lowheeled sandals, and she was the merest shade slimmer. But her startling black hair and her glorious green eyes seemed almost to fade the unhappy Ormiston girl to a colorless dun, and the coppery hair and blue eyes seemed water pale. It wasn't fair; Hull realized that it was like comparing candlelight to sunbeam, and he despised himself even for gazing. "Hull," said the Princess, "which of us is the more beautiful ?" He saw Vail's lips twitch fearfully, and he remained stubbornly silent. "Hull," resumed the Princess, "which of us do you love?" "I love Vail!" he muttered. "But do you love her more than you love me?" Once again he had recourse to silence. "I take it," said the Princess, smiling, "that your silence means you love me the more. Am I right?" "Or am I wrong, Hull? Surely you can give little Vail the satisfaction of answering this question! For unless you answer I shall take the liberty of assuming that you love me the more. Now do you?" He was in utter torment. His white lips twisted in anguish as he muttered finally, "Oh, God! Then yes!" She smiled softly. "You may go," she said to the pallid and frightened Vail. But for a moment the girl hesitated. "Hull," she whispered, "Hull, I know you said that to save me. I don't believe it, Hull, and I love you. I blame —her!" "Don't!" he groaned. "Don't insult her." The Princess laughed, "Insult me! Do you think I could be insulted by a bit of creeping dust as it crawls its way from cradle to grave?" She turned contemptuous green eyes on Vail as the terrified girl backed through the door. "Why do you delight in torture?" cried Hull. "You're cruel as a cat. You're no less than a demon." "That wasn't cruelty," said the Princess gently. "It was but a means of proving what I said, that your mighty muscles are well-broken to my saddle." "If that needed proof," he muttered. "It needed none. There's proof enough, Hull, in what's happening even now, if I judge the time rightly. I mean your Harriers slipping through their ancient sewer right into my trap behind the barn." He was thunderstruck. "You—are you—you must be a witch!" he gasped. "Perhaps. But it wasn't witchcraft that led me to put the thought of that sewer into your head, Hull. Do you remember now that it was my suggestion, given last evening there in the hallway? I knew quite well that you'd put the bait before the Harriers." His brain was reeling. "But why—Why—?" "Oh," she said indifferently, "it amuses me to see you play the traitor twice, Hull Tarvish." The princess stepped close to him, her magnificent eyes gentle as an angel's, the sweet curve of her lips in the ghost of a pouting smile. "Poor, strong, weak Hull Tarvish!" she breathed. "Now you shall have a lesson in the cost of weakness. I am not Joaquin, who fights benignly with his men's slides in the third notch. When I go to battle, my beams flash full, and there is burning flesh and bursting heart. Death rides with me." He scarcely heard her. His gyrating mind struggled with an idea. The Harriers were creeping singly into the trap, but they could not all be through the tunnel. If he could warn them—His eyes shifted to the bell-pull in the hall beside the guard, the rope that tolled the bronze bell in the belfry to summon public gatherings, or to call aid to fight fires. Death, beyond doubt, if he rang it, but that was only a fair price to pay for expiation. His great arm flashed suddenly, sweeping the Princess from her feet and crashing her dainty figure violently against the wall. He heard her faint "O —o—oh" of pain as breath left her and she dropped slowly to her knees, but he was already upon the startled guard, thrusting him up and over the rail of the stair-well to drop with a sullen thumb below. And then he threw his weight on the bellrope, and the great voice of bronze boomed out, again, and again. But Black Margot was on her feet, with the green hell-sparks flickering in her eyes and her face a lovely mask of fury. Men came rushing up the stairs with drawn weapons, and Hull gave a last tug on the rope and turned to face death. Half a dozen weapons were on him. "No—no!" gasped the Princess, struggling for the breath he had knocked out of her. "Hold him—for me! Take him—to the barn!" She darted down the stairway, her graceful legs flashing bare, her bare feet padding softly. After her six grim Empire men thrust Hull past the dazed guard sitting on the lower steps and out into a night where blue beams flashed and shots and yells sounded. Behind the barn was comparative quiet, however, by the time Hull's captors had marched him there. A close-packed mass of dark figures huddled near the mouth of the ancient tunnel, where the bushes were trampled away, and a brown-clad file of Empire woods runners surrounded them. A few figures lay sprawled on the turf, and Hull smiled a little as he saw that some were Empire men. Then his eyes strayed to the Princess where she faced a dark-haired officer. "A hundred and forty or fifty, Your Highness." "Not half! Why are you not pursuing the rest through the tunnel?" "Because, Your Highness, one of them pulled the shoring and the roof down upon himself, and blocked us off. We're digging him out now." "By then they'll have left their burrow. Where does this tunnel end?" She strode over to Hull. "Hull, where does this tunnel end?" At his silence, she added. "No matter. They'd be through it before we could reach it." She spun back. "Lebeau! Burn down what we have and the rest we'll stamp out as we can." A murmur ran through the crowd of villagers that was collecting, and her eyes, silvery green in the moonlight, flickered over them. "And any sympathizers," she added coldly. "Except this man, Hull Tarvish." File Ormson's great voice rumbled out of the mass of prisoners. "Hull! Hull! Was this trap your doing?" Hull made no answer, but Black Margot herself replied. "No," she snapped, "but the warning bell was." "Then why do you spare him?" Her eyes glittered icy green. "To kill in my own way, Weed," she said in tones so cold that it was as if a winter wind had sent a shivering breath across the spring night. "I have my own account to collect from him." Her eyes blazed chill emerald fire into Hull's. He met her glance squarely, and said in a low voice, "Do you grant any favors to a man about to die?" "Not by custom," she replied indifferently. "Is it the safety of the eldarch's daughter? I plan no harm to her." "Then ask it—though I am not disposed to grant favors to you, Hull Tarvish, who have twice laid hands of violence on me." His voice dropped almost to a whisper. "It is the lives of my companions I ask." She raised here eyebrows in surprise, then shook her ebony flame of hair. "How can I? I remained here purposely to wipe them out. Shall I release the half I have, only to destroy them with the rest?" "I ask their lives," he repeated. A curious, whimsical fire danced green in her eves. "I will try," she promised, and turned to the officer, who was ranging his men so that the cross-fire of execution could not mow down his own ranks. "Lebeau!" she snapped. "Hold back a while." She strode into the gap between the prisoners and her own men. Hand on hip she surveyed the Harriers, while moonlight lent her beauty an aura that was incredible, unearthly. There in the dusk of night she seemed no demon at all, but a girl, almost a child, and even Hull, who had learned well enough what she was, could not but sweep fascinated eyes from her jet hair to her tiny white feet. "Now," she said, passing her glance over the group, on my promise of amnesty, how many of you would join me?" A stir ran through the mass. For a moment there was utter immobility, then, very slowly, two figures moved forward, and the stir became an angry murmur. Hull recognized the men; they were stragglers of the Confederation army, Ch'cago men, good fighters but merely mercenaries, changing sides as mood or advantage moved them. The murmur of the Harriers became an angry growl. "You two," said the Princess, "are you Ormiston men?" "No," said one. "Both of us come from the shores of Mitchin." "Very well," she proceeded calmly. With a movement swift as arrow flight she snatched the weapon from her belt, the blue beam spat twice, and the men crumpled, one with face burned carbon-black, and both sending forth an odorous wisp of flesh-seared smoke. She faced the aghast group. "Now," she said, "Who is your leader?" File Ormson stepped forth, scowling and grim. "What do you want of me?" "Will you treat with me? Will your men follow your agreements?" File nodded. "They have small choice." "Good. Now that I have sifted the traitors from your ranks—for I will not deal with traitors—I shall make my offer." She smiled at the squat ironsmith. "I think I've served both of us by so doing," she said softly, and Hull gasped as he perceived the sweetness of the glance she bent on the scowling File. "Would you, with your great muscles and warrior's heart, follow a woman?" The scowl vanished in surprise. "Follow you? You?" "Yes." Hull watched her in fascination as she used her voice, her eyes, her unearthly beauty intensified by the moonlight, all on hulking File Ormson, behind whom the Harrier prisoners stood tense and silent. "Yes, I mean to follow me," she repeated softly. "You are brave men, all of you, now that I have weeded out the two cowards." She smiled wistfully, almost tenderly at the squat figure before her. "And you—you are a warrior." "But—" File gulped, "our others—"
"I promise you need not fight against your companions. I will release any of you who will not follow me. And your lands—it is your lands you fight for, is it not? I will not touch, not one acre save the eldarch's." She paused. "Well?" Suddenly File's booming laugh roared out. "By God!" he swore. "If you mean what you say, there's nothing to fight about! For my part, I'm with you!" He turned on his men. "Who follows me?" The group stirred. A few stepped forward, then a few more, and then, with a shout, the whole mass. "Good!" roared File. He raised his great hard hand to his heart in the Empire salute. "To Black—to the Princess Margaret!" he bellowed. "To a warrior!" She smiled and dropped her eyes as if in modesty. When the cheer had passed, she addressed File Ormson again. "You will send men to your others?" she asked. "Let them come in on the same terms." The Princess nodded. "Lebeau," she called, "order off your men. These are our allies." The Harriers began to separate, drifting away with the crowd of villagers. The Princess stepped close to Hull, smiling maliciously up into his perplexed face. He scarcely knew whether to be glad or bitter, for indeed, though she had granted his request to spare his companions, she had granted it only at the cost of the destruction of the cause for which he had sacrificed everything. There were no Harriers any more, but he was still to die for them. "Will you die happy now?" she cooed softly. "No man dies happy," he growled. "I granted your wish, Hull." "If your promises can be trusted," he retorted bitterly. "You lied coolly enough to the Ch'cago men, and you made certain they were not loved by the Harriers before you killed them." She shrugged. "I lie, I cheat, I swindle by whatever means comes to hand," she said indifferently, "but I do not break my given word. The Harriers are safe." Beyond her, men came suddenly from the tunnel mouth, dragging something dark behind them. "The Weed who pulled down the roof, Your Highness," said Lebeau. She glanced behind her, and pursed her dainty lips in surprise. "The eldarch! The dotard died bravely enough." Then she shrugged. "He had but a few more years anyway." But Vail slipped by with a low moan of anguish, and Hull watched her kneel desolately by her father's body. A spasm of pity shook him as he realized that now she was utterly, completely alone. Enoch had died in the ambush of the previous night, old Marcus lay dead here before her, and he was condemned to death. The three who loved her and the man she loved—all slain in two nights passing. He bent a slow, helpless, pitying smile on her, but there was nothing he could do or say. And Black Margot, after the merest glance, turned back to Hull, "Now," she said, the ice in her voice again, "I deal with you!" He faced her dumbly. "Will you have the mercy to deal quickly, then?" he muttered at last. "Mercy? I do not know the word where you're concerned, Hull. Or rather I have been already too merciful. I spared your life three times—once at Joaquin's request at Eaglefoot Flow, once before the guardhouse, and once up there in the hallway." She moved closer. "I cannot bear the touch of violence, Hull, and you have laid violent hands on me twice. Twice!" "Once was to save your life," he said, "and the other to rectify my own unwitting treason. And I spared your life three times too, Black Margot —once when I aimed from the church roof, once from the ambush in the west chamber, and once but a half hour ago, for I could have killed you with this fist of mine, had I wished to strike hard enough. I owe you nothing." She smiled coldly. "Well argued, Hull, but you die none the less in the way I wish." She turned. "Back to the house!" she commanded, and he strode away between the six guards who still flanked him. She led them into the lower room that had been the Master's. There she sat idly in a deep chair of ancient craftsmanship, lit a black cigarette at the lamp, and thrust her slim legs carelessly before her, gazing at Hull. But he, staring through the window behind her, could see the dark blot that was Vail Ormiston weeping beside the body of her father. "Now," said the Princess, "how would you like to die, Hull. Of old age!" he snapped. "And if you will not permit that, then as quickly as possible." "I might grant the second," she observed. "I might." The thought of Vail was still torturing him. At last he said, "Your Highness, is your courage equal to the ordeal of facing me alone? I want to ask something that I will not ask in others' ears." She laughed contemptuously. "Get out," she snapped at the silent guards. "Hull, do you think I fear you? I tell you your great muscles and stubborn heart are no more than those of Eblis, the black stallion. Must I prove it again to you?" "No," he muttered. "God help me, but I know it's true. I'm not the match for Black Margot." "Nor is any other man," she countered. Then, more softly, "But if ever I do meet the man who can conquer me, if ever he exists, he will have something of you in him, Hull. Your great, slow strength, and your stubborn honesty, and your courage. I promise that." She paused, her face now pure as a marble saint's. "So say what you have to say, Hull. What do you ask?" "My life," he said bluntly. Her green eyes widened in surprise. "You, Hull? You beg your life? You?" "Not for myself," he muttered. "There's Vail Ormiston weeping over her father. Enoch, who would have married her and loved her, is dead in last night's ambush, and if I die, she's left alone. I ask my life for her." "Her troubles mean nothing to me," said Margaret of N'Orleans coldly. "She'll die without someone—someone to help her through this time of torment." "Let her die, then. Why do you death-bound cling so desperately to life, only to age and die anyway? Sometimes I myself would welcome death, and I have infinitely more to live for than you. Let her die, Hull, as I think you'll die in the next moment or so!" Her hand rested on the stock of the weapon at her belt. "I grant your second choice," she said coolly. "The quick death." Black Margot ground out her cigarette with her left hand against the polished wood of the table top, but her right rested inexorably on her weapon. Hull knew beyond doubt or question that he was about to die, and for a moment he considered the thought of dying fighting, of being blasted by the beam as he flung himself at her. Then he shook his head; he revolted at the idea of again trying violence on the exquisite figure he faced, who, though witch or demon, had the passionless purity and loveliness of divinity. It was easier to die passively, simply losing his thoughts in the glare of her unearthly beauty. She spoke. "So die, Hull Tarvish," she said gently, and drew the blunt weapon. A voice spoke behind him, a familiar, pleasant voice. "Do I intrude, Margaret?" He whirled. It was Old Einar, thrusting his goodhumored, wrinkled visage through the opening he had made in the doorway. He grinned at Hull, flung the door wider, and slipped into the room. "Einar!" cried the Princess, springing from her chair. "Einar Olin! Are you still in the world?" Her tones took on suddenly the note of deep pity. "But so old—so old!" The old man took her free hand. "it is forty years since last I saw you, Margaret—and I was fifty then,"
"But so old!" she repeated. "Einar, have I changed?" He peered at her. "Not physically, my dear. But from the stories that go up and down the continent, you are hardly the gay madcap that N'Orleans worshipped as the Princess Peggy, nor even the valiant little warrior they used to call the Maid Of Orleans." She had forgotten Hull, but the guards visible through the half open door still blocked escape. He listened fascinated, for it was almost as if he saw a new Black Margot. "Was I ever the Princess Peggy?" she murmured. "I had forgotten— Well, Martin Sair can stave off age but he cannot halt the flow of time. But Einar—Einar, you were wrong to refuse him!" "Seeing you, Margaret, I wonder instead if I were not very wise. Youth is too great a restlessness to bear for so long a time, and you have borne it less than a century. What will you be in another fifty years? In another hundred, if Martin Sair's art keeps its power? What will you be?" She shook her head; her green eyes grew deep and sorrowful. "I don't know, Einar. I don't know." "Well," he said placidly, "I am old, but I am contented. I wonder if you can say as much." "I might have been different, Einar, had you joined us. I could have loved you, Einar." "Yes," he agreed wryly. "I was afraid of that, and it was one of the reasons for my refusal. You see, I did love you, Margaret, and I chose to outgrow the torture rather than perpetuate it. That was a painful malady, loving you, and it took all of us at one time or another. 'Flame-struck', we used to call it." He smiled reflectively. "Are any left save me of all those who loved you?" "Just Jorgensen," she answered sadly. "That is if he has not yet killed himself in his quest for the secret of the Ancient's wings. But he will." "Well," said Olin dryly, "my years will yet make a mock of their immortality." He pointed a gnarled finger at Hull. "What do you want of my young friend here?" Her eyes flashed emerald, and she drew her hand from that of Old Einar. "I plan to kill him." "Why?" Her voice chilled. "Because he struck me with his hands. Twice." The old man smiled. "I shouldn't wonder if he had cause enough, Margaret. Memory tells me that I myself have had the same impulse." "Then it's well you never yielded, Einar. Even you." "Doubtless. But I think I shall ask you to forgive young Hull Tarvish." "You know his name! Is he really your friend?" Old Einar nodded. "I ask you to forgive him." "Why should I?" asked the Princess. "Why do you think a word from you can save him?" "I am still Olin," said the aged one, meeting her green eyes steadily with his watery blue ones. "I still carry Joaquin's seal." "As if that could stop me!" But the cold fire died slowly in her gaze, and again her eyes were sad. "But you are still Olin, the Father of Power," she murmured. With a sudden gesture she thrust her weapon back into her belt. "I spare him again," she said, and then, in tones gone strangely dull, "I suppose I wouldn't have killed him anyway. It is a weakness of mine that I cannot kill those who love me in a certain way—a weakness that will cost me dear some day." Olin twisted his lips in that skull-like smile, turning to the silent youth. "Hull," he said kindly, "you must have been born under fortunate stars. But if you're curious enough to tempt your luck further, listen to this old man's advice." His smile became a grin. "Beyond the western mountains there are some very powerful, very rare hunting cats called lions, which Martin Sair says are not native to this continent, but were brought here by the Ancients to be caged and gazed at, and occasionally trained. As to that I know nothing, but I do say this, Hull—go twist the tail of a lion before you again try the wrath of Black Margot. And now get out of here." "Not yet, Hull," snapped the Princess. "I have still my score to settle with you." She turned back to Olin. "Where do you wander now, Einar?" "To N'Orleans. I have some knowledge to give Jorgensen, and I am homesick besides for the Great City." He paused. "I have seen Joaquin. Selui has fallen." "I know. I ride to meet him tonight." "He has sent representations to Ch'cago." "Good!" she flashed. "Then there will be fighting." Then her eyes turned dreamy. "I have never seen the saltless seas," she added wistfully, "but I wonder if they can be as beautiful as the blue Gulf beyond N'Orleans." But Old Einar shook his thin white hair. "What will be the end of this, Margaret?" he asked gently. "After Ch'cago is taken—for you will take it—what then?" "Then the land north of the saltless seas, and east of them. N'York, and all the cities on the ocean shore." "Then South America, I suppose." "Then? There is still Europe veiled in mystery, and Asia, Africa— all the lands known to the Ancients." "And after all of them?" "Afterwards," she replied wearily, "we can rest. The fierce destiny that drives Joaquin surely cannot drive him beyond the boundaries of the world." "And so," said Olin, "you fight your way around the world so you can rest at the end of the journey. Then why not rest now, Margaret? Must you pillow your head on the globe of the planet?" Fury flamed green in her eyes. She raised her hand and struck the old man across his lips, but it must have been lightly, for he still smiled. "Fool!" she cried. "Then I will see to it that there is always war! Between me and Joaquin, if need be—or between me and anyone— anyone—so that I fight!" She paused panting. "Leave me, Einar," she said tensely. "I do not like the things you bring to mind." Still smiling, the old man backed away. At the door he paused. "I will see you before I die, Margaret," he promised, and was gone. She followed him to the doorway. "Sora!" she called. "Sora! I ride!" Hull heard the heavy tread of the fat Sora, and in a moment she entered bearing the diminutive cothurns and a pair of glistening silver gauntlets on her hands, and then she too was gone. Slowly, almost wearily, the Princess turned to face Hull, who had as yet permitted no gleam of hope to enter his soul, for he had experienced too much of her mockery to trust the promise of safety Old Einar had won for him. He felt only the fascination that she always bound about him, the spell of her unbelievable black hair and her glorious sea-green eyes, and all her unearthly beauty. "Hull," she said gently, "what do you think of me now?" "I think you are a black flame blowing cold across the world. I think a demon drives you." "And do you hate me so bitterly?" "I pray every second to hate you." "Then see, Hull." With her little gauntleted fingers she took his great hands and placed them about the perfect curve of her throat. "Here I give you my life for the taking. You have only to twist once with these mighty hands of yours and Black Margot will be out of the world forever." She paused. "Must I beg you?" Hull felt as if molten metal flowed upward through his arms from the touch of her white skin. His fingers were rigid as metal bars, and all the great strength of them could not put one feather's weight of pressure on the soft throat they circled. And deep in the lambent emerald flames that burned in her eyes he saw again the fire of mockery—jeering, taunting. "You will not?" she said, lifting away his hands, but holding them in hers. "Then you do not hate me?" "You know I don't," he groaned. "And you do love me?" "Please," he muttered. "Is it necessary again to torture me? I need no proof of your mastery." "Then say you love me." "Heaven forgive me for it;" he whispered, "but I do!" She dropped his hands and smiled. "Then listen to me, Hull. You love little Vail with a truer love, and month by month memory fades before reality. After a while there will be nothing left in you of Black Margot, but there will be always Vail. I go now hoping never to see you again, but" —and her eyes chilled to green ice—"before I go I settle my score with you." She raised her gauntleted hand. "This for your treachery!" she said, and struck him savagely across his right check. Blood spouted, there would be scars, but he stood stolid. "This for your violence!" she said, and the silver gauntlet tore his left check. Then her eyes softened. "And this," she murmured, "for your love!" Her arms circled him, her body was warm against him, and her exquisite lips burned against his. He felt as if he embraced a flame for a moment, and then she was gone, and a part of his soul went with her. When he heard the hooves of the stallion Eblis pounding beyond the window, he turned and walked slowly out of the house to where Vail still crouched beside her father's body. She clung to him, wiped the blood from his cheeks, and strangely, her words were not of her father, nor of the sparing of Hull's life, but of Black Margot. "I knew you lied to save me," she murmured. "I knew you never loved her." And Hull, in whom there was no falsehood, drew her close to him and said nothing. But Black Margot rode north from Selui through the night. In the sky before her were thin shadows leading phantom armies, Alexander the Great, Attila, Genghis Khan, Tamerlane, Napoleon, and clearer than all, the battle queen Semiramis. All the mighty conquerors of the past, and where were they, where were their empires, and where, even, were their bones? Far in the south were the graves of men who had loved her, all except Old Einar, who tottered like a feeble grey ghost across the world to find his. At her side Joaquin Smith turned as if to speak stared, and remained silent. He was not accustomed to the sight of tears in the eyes and on the cheeks of Black Margot.